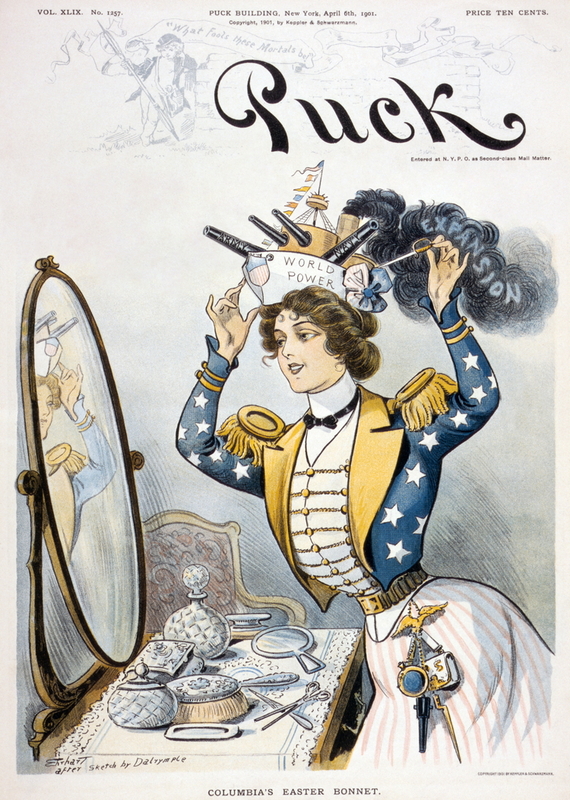 The cartoons were published in the satirical magazine "Puck" (1871-1918) founded by Joseph Keppler in St. Louis but which later moved to New York city. 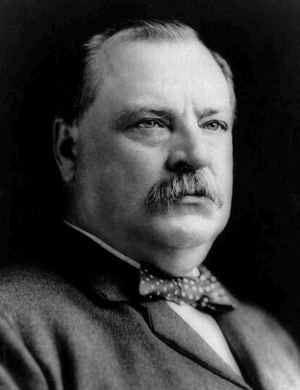 Generally, it supported the so-called "Bourbon Democrats" associated with Grover Cleveland (elected President 1884, 1888, 1892) and could be described as the classical liberal branch of the Democratic Party, supporting laissez-faire economic policies and the gold standard and opposing tariffs and overseas expansion and imperialism. 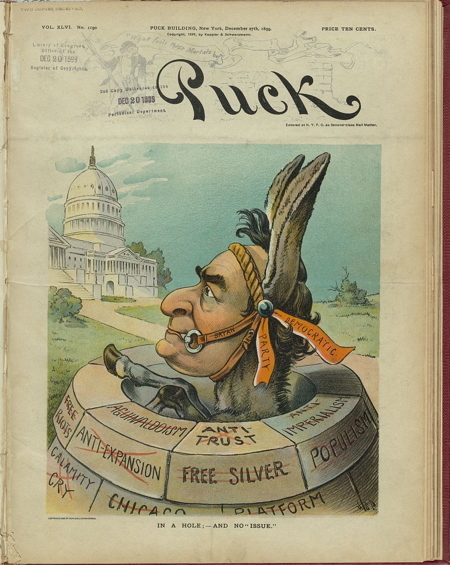 Unfortunately Puck magazine broke with the Bourbon Democrats over the question of American expansion during the Spanish-American War and published many pro-expansion cartoons between 1898 and 1905. 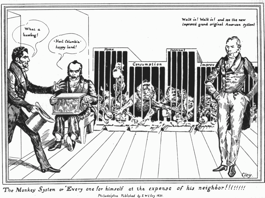 The anti-imperialist cause was taken up by a group of older politicians and intellectuals who saw expansionism as a violation of the principles of the American Constitution and individual liberty. 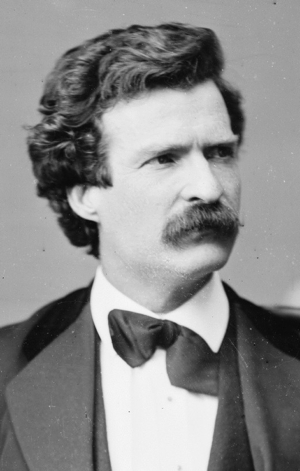 The formation of the Anti-Imperialist League in June 1898 brought together individuals such as the following: Charles Francis Adams, Jr., Jane Addams, Edward Atkinson, Ambrose Bierce, George S. Boutwell, Andrew Carnegie, Samuel Clemens (Mark Twain), Grover Cleveland, John Dewey, Edwin Lawrence Godkin, William Dean Howells, Henry James, William James, David Starr Jordan, Carl Schurz, Moorfield Storey, William Graham Sumner, and Oswald Garrison Villard. 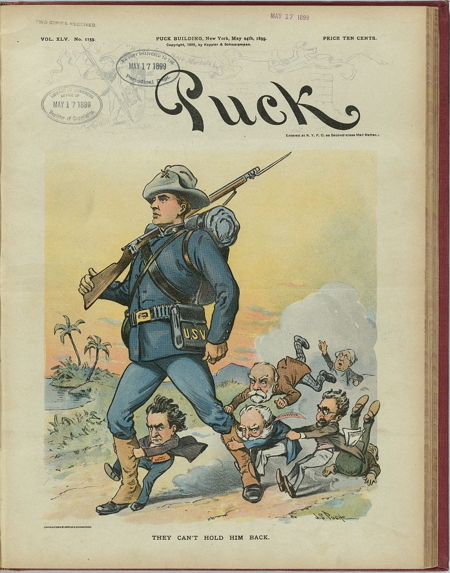 Puck magazine singled out Edward Atkinson, Edwin Lawrence Godkin, Carl Schurz, and Grover Cleveland for particular attention. 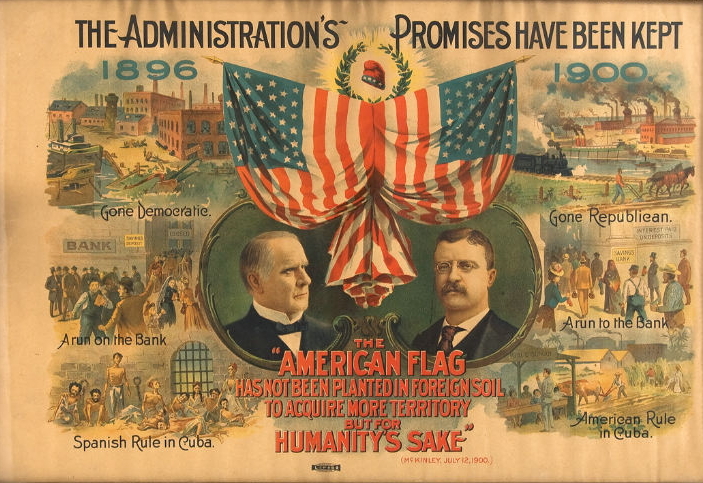 Some political background: the Spanish-American War began on 25 April, 1898 when President McKinley ordered an attack on Spanish forces in Cuba to assist the Cuban independence movement, followed by the seizure of the Philippines in May; the Anti-Imperialist League was founded on 15 June, 1898 to oppose the annexation of the Philippines; the Philippine War of Independence was fought against American occupation between 1899 and 1902; Emilio Aguinaldo was the president of the Philippines independence movement; the American presidential election of 1900 was contested by the sitting Republican President William McKinley and the Democratic challenger William Jennings Bryan, which McKinley won with 51.6% of the vote; the Anti-Imperialist League was split over the 1900 presidential election with one group favouring the anti-imperialist (but anti-gold standard) Bryan and others supporting a third party candidate; the Anti-Imperialist League was also split over US entry into WW1 and finally was dissolved in 1921. 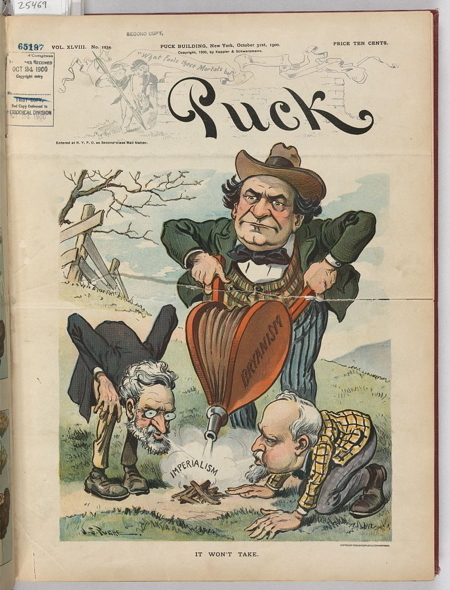 The US Presidential campaign of 1900 pitted the Democratic Party's William Jennings Bryan and VP nominee Adlai Stevenson against sitting Republican President William McKinley and VP Theodore Roosevelt. 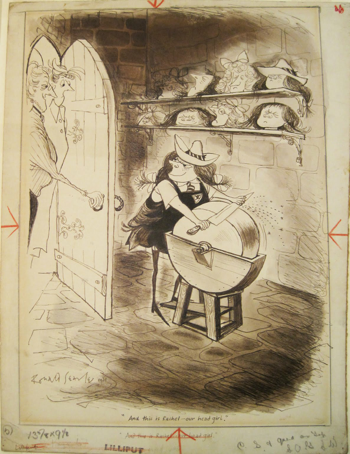 I have selected about 20 cartoons from Puck magazine spanning the years 1898-1902 to display here in chronological order of publication. 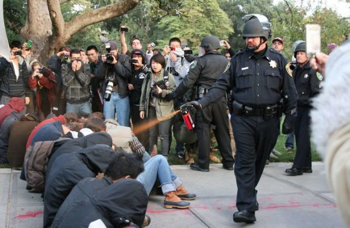 The description and other information about each image comes from the LoC website [our tax dollars hard at work!]. 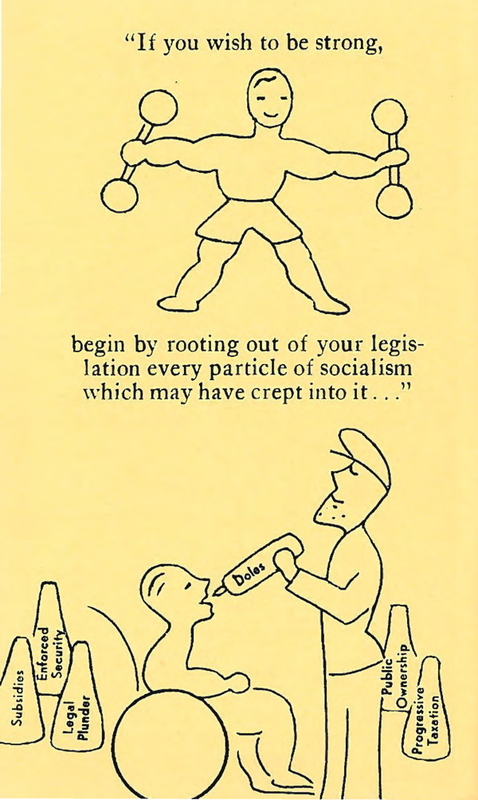 First I have some details from the cartoons of the caricatures of leading members of the Anti-Imperialist League. 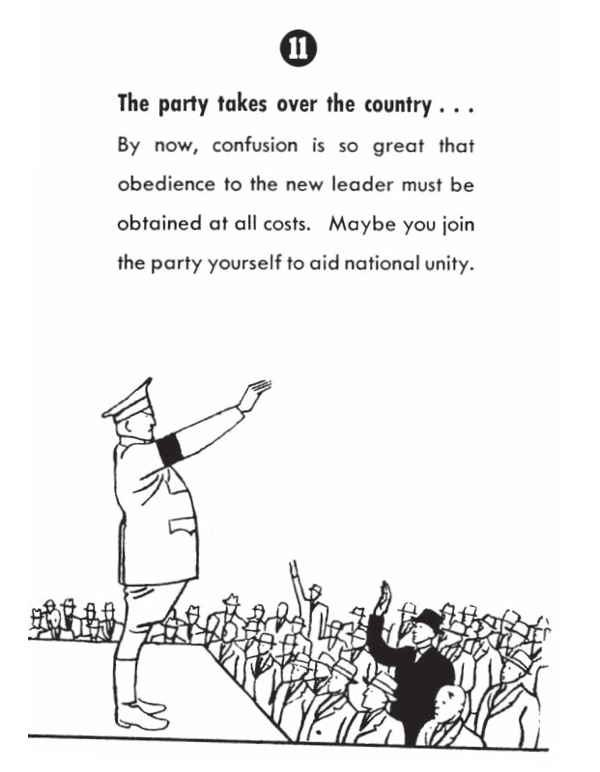 Then follows the full cartoons. 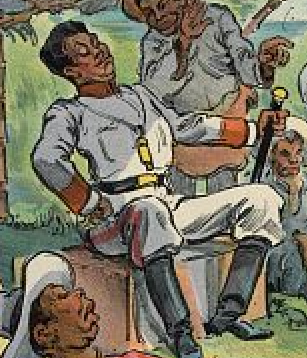 A haughty President Aguinaldo accepting the surrender of the Americans. 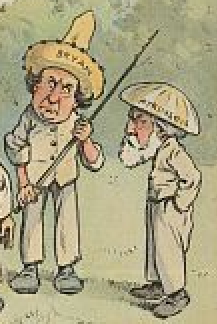 Atkinson dressed as a Filipino peasant. 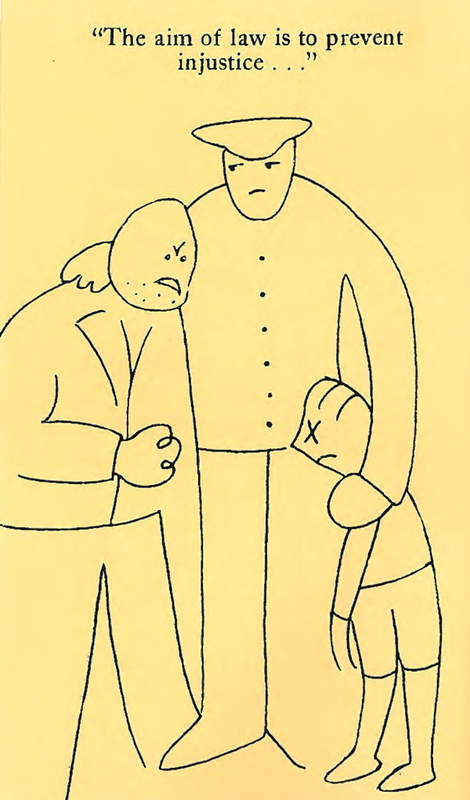 Atkinson and Godkin vainly trying to hold back a giant American soldier. 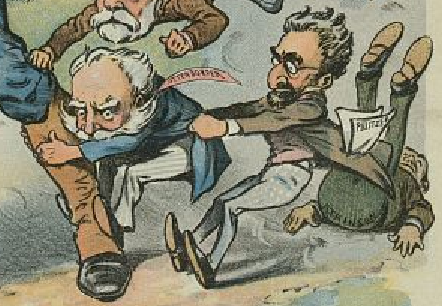 Atkinson, Godkin and Schurz walking away from Washington having been defeated in the election. 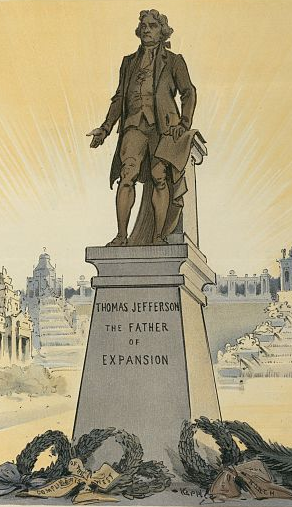 A statue of Jefferson proclaiming him to be the father of American expansionism. 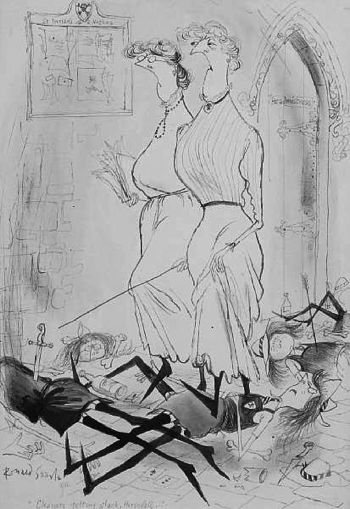 Godkin as an old woman attempting to pull down a statue of the administration. 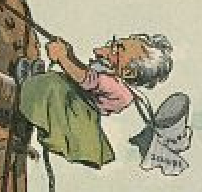 Schurz as an old woman attempting to pull down a statue of the administration. 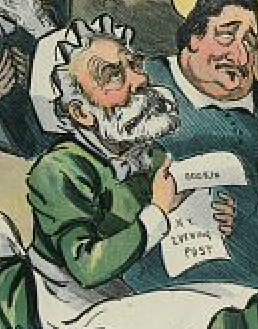 Another depiction of Godkin as an old woman (holding the NY Evening Post). 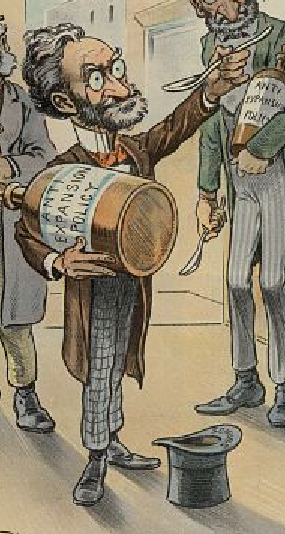 Schurz offering Uncle Sam a spoonful of "Anti-Expansion Policy" medicine. 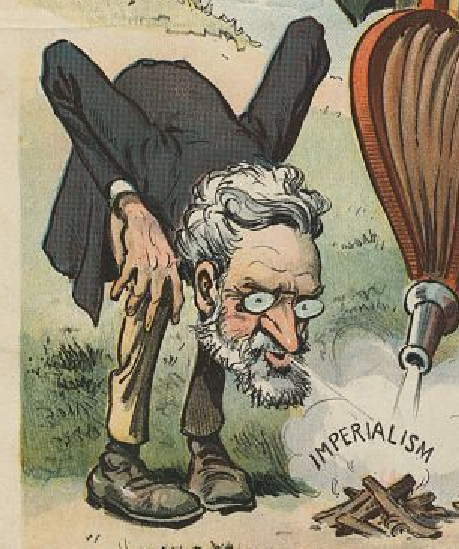 Schurz vainly trying to blow out the fire of imperialism which W.J. Bryan is fanning into flames with some bellows. 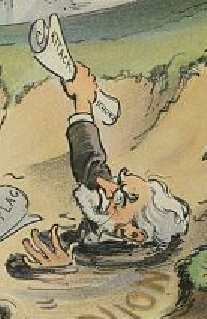 Schurz drowning in the quicksand of pro-empire public opinion. 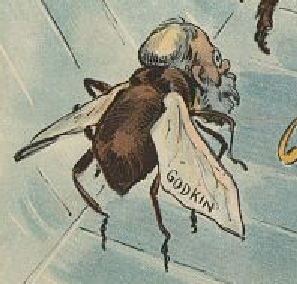 Godkin as a "silly fly" caught in the spider's web spun by W.J. Bryan. 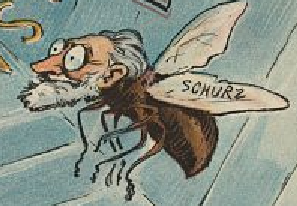 Schurz as a "silly fly" caught in the spider's web spun by W.J. Bryan. 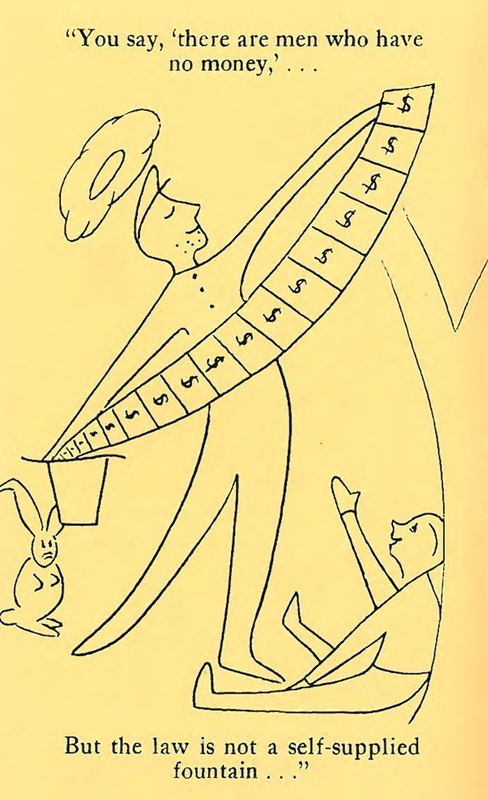 The complete cartoons from Puck. 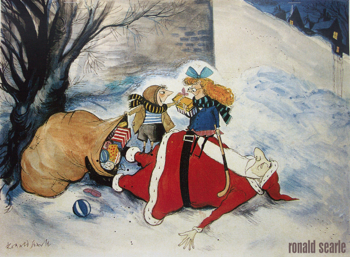 "Who will haul it down? 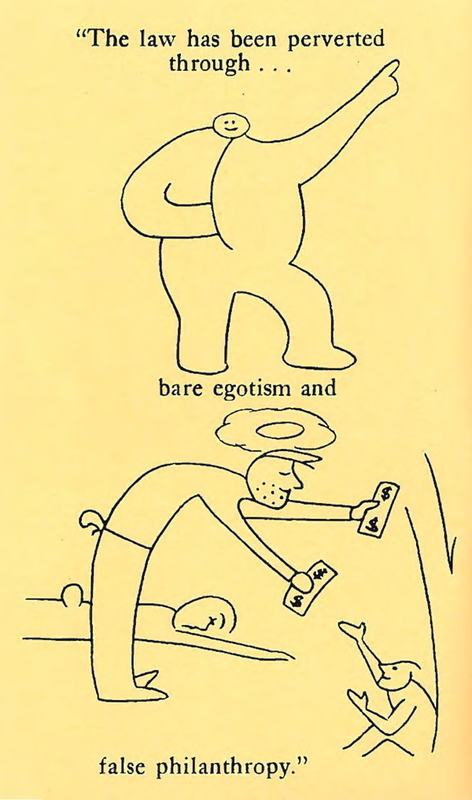 "by Louis Dalrymple. (1899 January 11). Print shows President William McKinley standing on a road leading to the White House at the end of the road, in the background; he is delivering a speech, with a group of newspaper editors and congressmen, to the left and right, who have broken into small groups, talking amongst themselves. 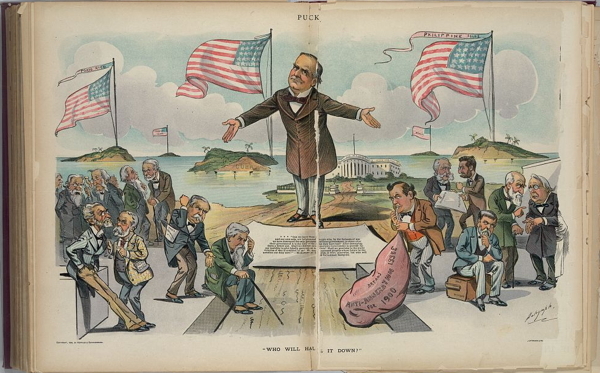 In the right foreground, William Jennings Bryan is inflating his "Anti-Annexation Issue for 1900". American flags are on islands beyond the White House, the flags and/or islands are labeled "Porto Rico, Ladrone Islds., Cuba, Hawaii, [and] Philippine Islds." At McKinley's feet is an excerpt from his "Speech at Banquet of Board of Trade and Associated Citizens" in Savannah, December 17th 1898. 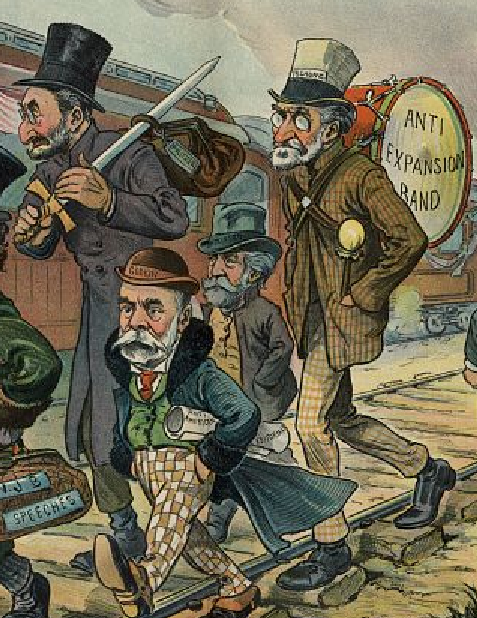 "The bugaboo of the anti-expansionist" by Udo Keppler. 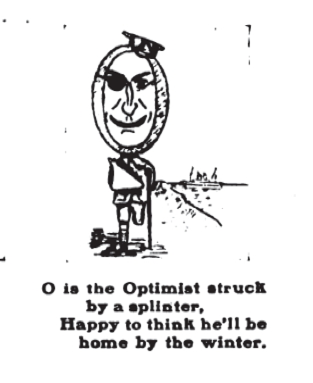 (1899 January 18). 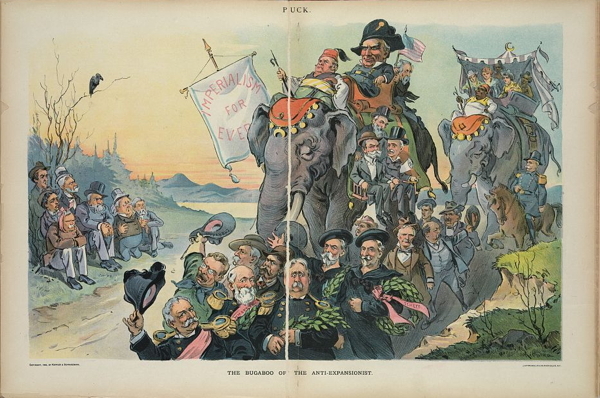 Print shows President William McKinley riding on an elephant driven by Marcus A. Hanna and carrying Russell A. Alger, Nelson Dingley, William R. Day, and William T. Sampson. 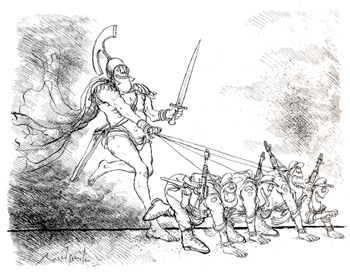 A second elephant follows, and a group of men that includes "Nelson A. 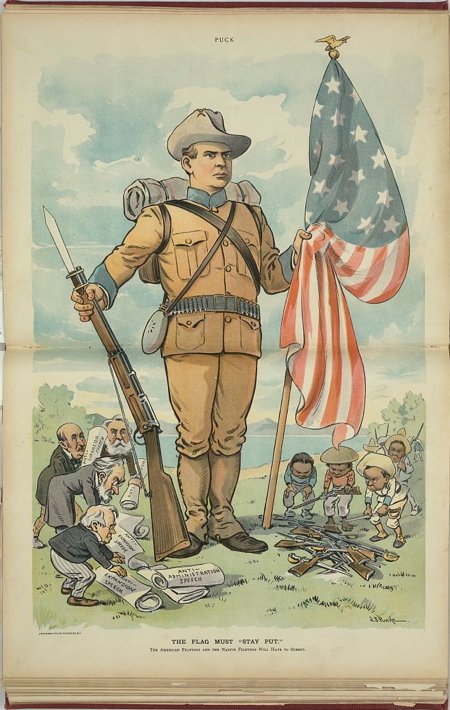 Miles, Theodore Roosevelt, Joseph Wheeler, Fitzhugh Lee, Henry C. Lodge, William R. Shafter, Winfield S. Schley, John T. Morgan, Cushman K. Davis, George Dewey, and others, march alongside under the standard "Imperialism for Ever". 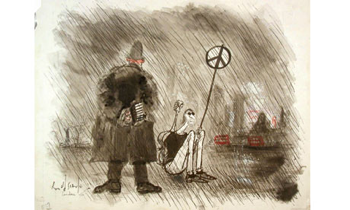 A group of disgruntled men sit on the roadside, watching the procession. 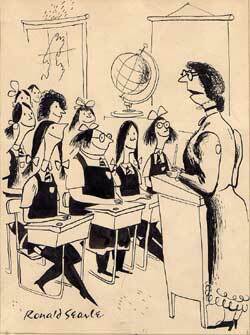 "Our busy old women" by J.S. Pughe. 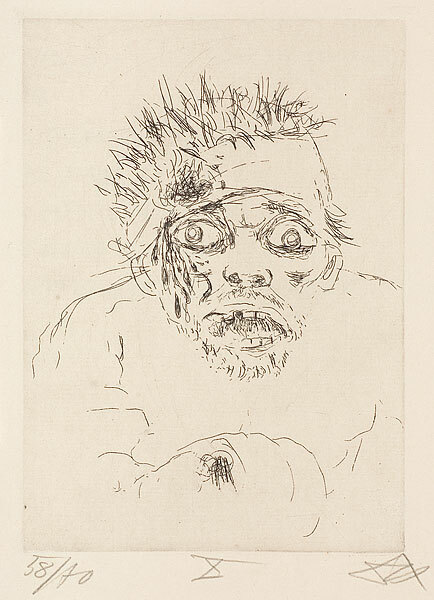 (1899 March 22). 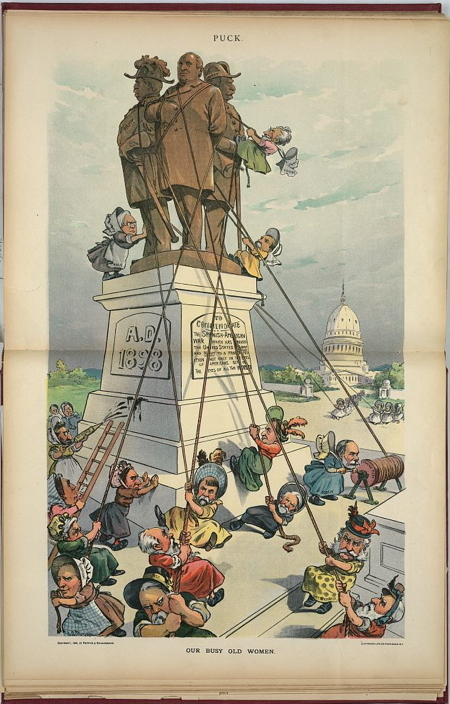 Print shows a large monument constructed "A.D. 1898" showing statues of President William McKinley labeled "Administration", General William R. Shafter labeled "Army", and Admiral George Dewey labeled "Navy", and a plaque that states "To Commemorate the Spanish-American War which has raised the United States Army and Navy to a proud position not only in the eyes of Americans but in the eyes of the World"; also, a gang of "Old Women" with ropes trying to pull down the statues. 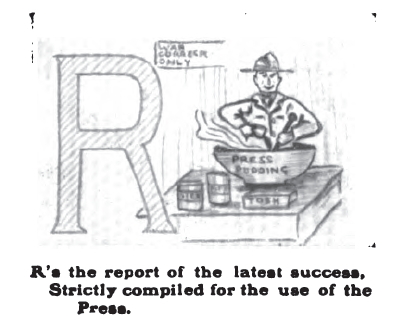 Among the identified women are "Schurz, Boutelle, Hoar, N.Y. World [Pulitzer], Cockran, Tillman, Caffery, Gorman, Vest, Jones, Hale, Bryan, Godkin [turning a crank for the] Evening Post, Sherman, Ottendorfer, [and] Edmunds". 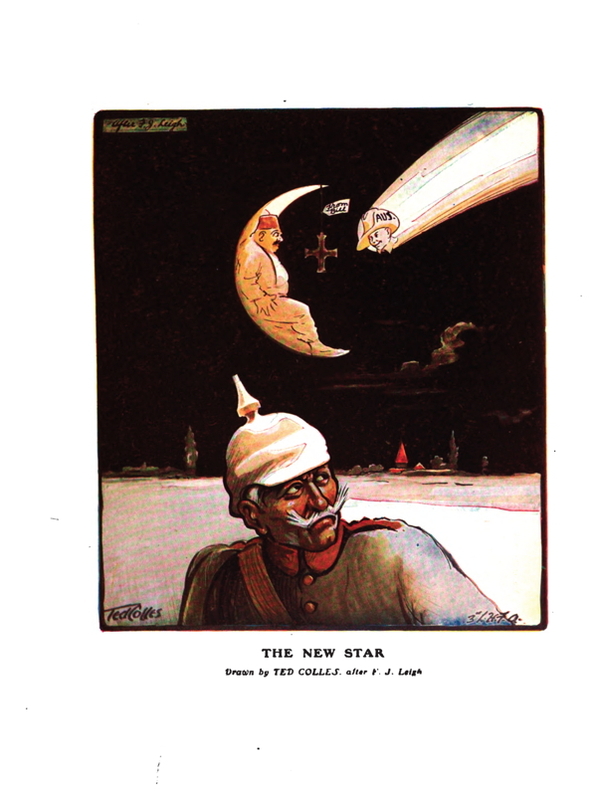 "The dream of the anti-expansionist" Udo Keppler. (1899 April 19). 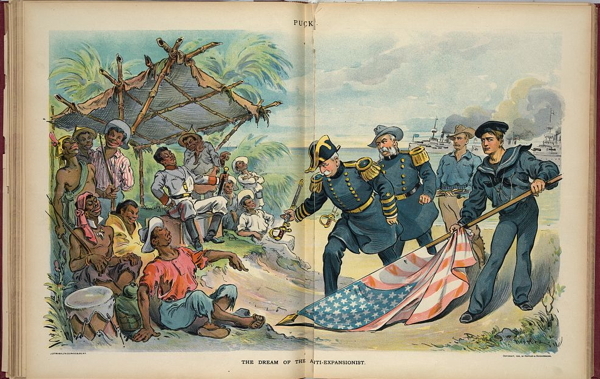 Print shows the dream of an "Anti-Expansionist" where Admiral George Dewey, General Elwell S. Otis, a sailor, and a soldier come ashore in the Philippines to offer their weapons and the American flag in surrender to Emilio Aguinaldo and a poorly armed, ragged, but haughty, group of Filipinos. 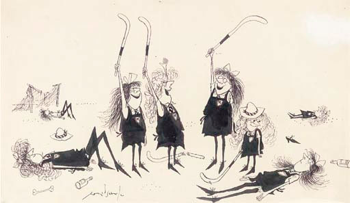 "The idol of the aunties" by Louis Dalrymple. (1899 May 10). 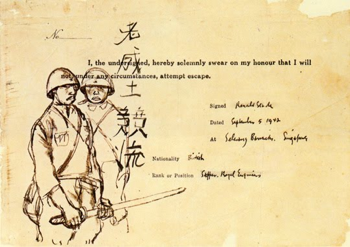 Print shows Emilio Aguinaldo standing at center, wearing military uniform, and holding a flag and a sword, around him are many old men dressed as women, supplicating themselves and tossing roses at his feet, among them are Carl Schurz, John P. Jones, Charles A. Boutelle, Edwin L. Godkin holding a paper labeled "N.Y. Evening Post", William B. Cockran, Eugene Hale, George G. Vest, Donelson Caffery, George F. Hoar playing a lyre labeled "Sen. Hoar", William Lloyd Garrison, Jr. reading his "Ode to Dear Aguinaldo", George F. Edmunds, Joseph Pulitzer, Oswald Ottendorfer, [and] William Jennings Bryan. There is a bundle of "Editorials" on a rock in the left foreground. "They can't hold him back" by J.S. Pughe. 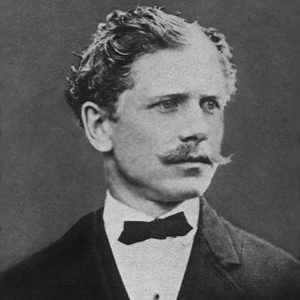 (1899 May 24). 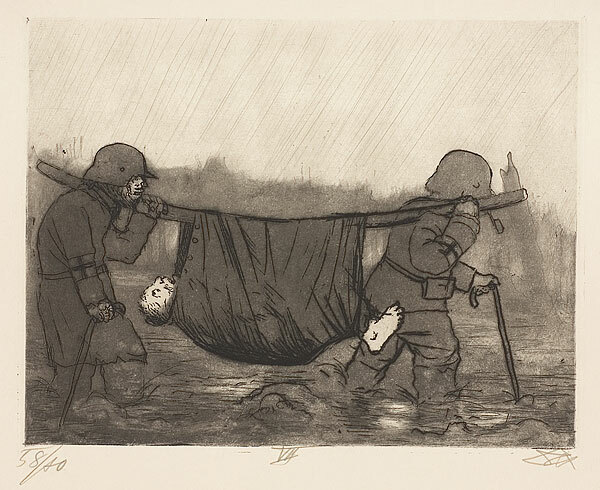 Print shows an American soldier carrying a rifle and bag labeled "U.S.V. 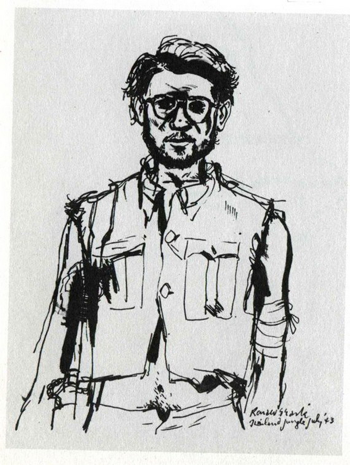 ", walking in a tropical location; diminutive figures labeled "Bryan, Ottendorfer, Pulitzer, Atkinson, [and] Godkin" are attempting to hold him back, George F. Hoar, left behind, stands with his right arm raised in the background. 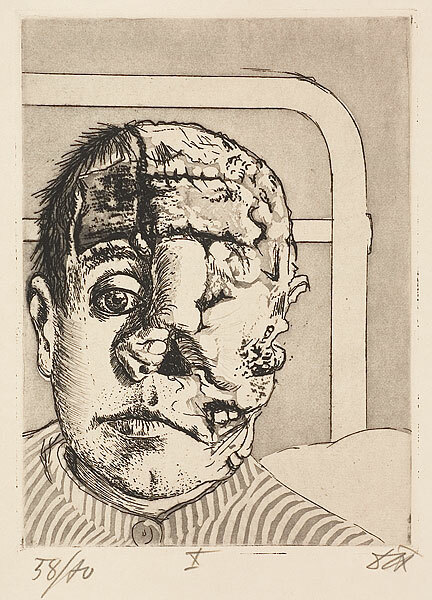 "Bryan's progress" by Louis Dalrymple. (1899 November 15). 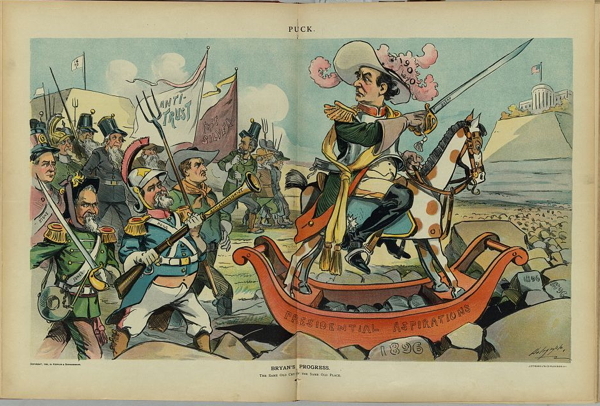 Print shows William Jennings Bryan wearing a plumed hat labeled "1900" and riding on a rocking horse labeled "Presidential Aspirations", leading a small army, among whom are William J. 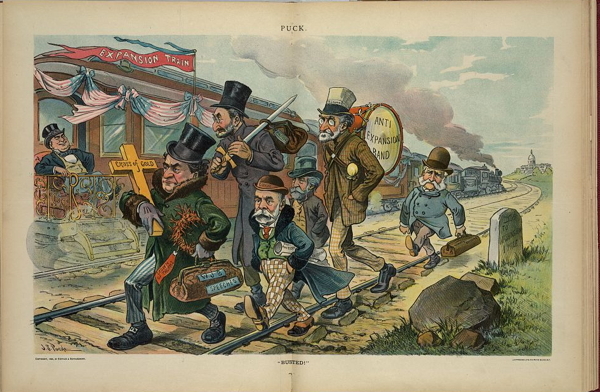 Stone, James K. Stone, James S. Hogg (carrying a blunderbuss labeled "Anti-Expansionist"), and Benjamin R. Tillman, also a "Silver Republican" and a "Populist", others carry flags labeled "Anti-Trust" and "Free Silver"; they have emerged from a fortress labeled "16 to 1" and are following a rocky road, with some rocks labeled "1896", toward a fortress topped with the White House. 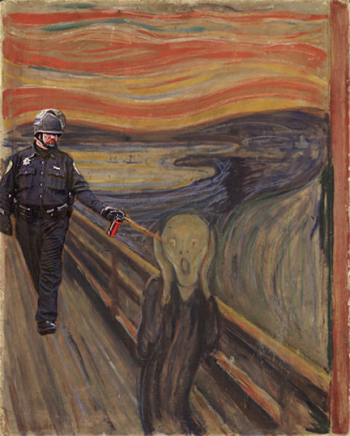 "Busted" by J.S. Pughe. 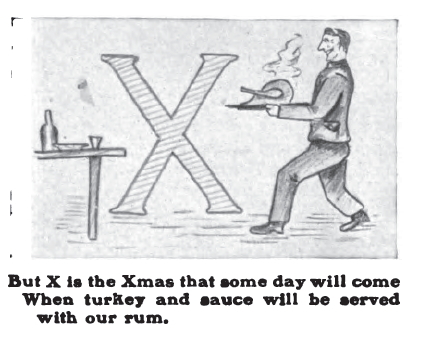 (1899 December 20). 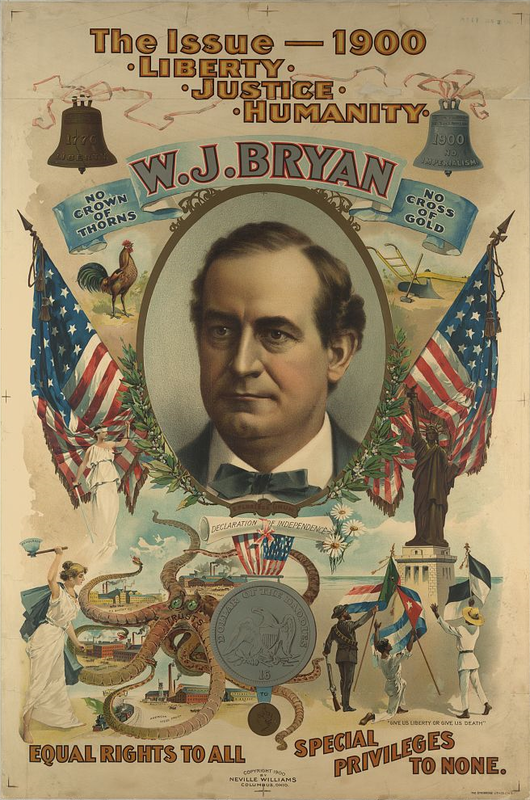 Print shows William Jennings Bryan carrying a "Cross of Gold", a "Crown of Thorns", and a carpetbag labeled "W.J.B. Speeches" as he walks along railroad tracks headed in the opposite direction of Washington, D.C.; walking with him are newspaper editors Edwin L. Godkin carrying papers labeled "Anti-American Editorials", Joseph Pulitzer, Edward Atkinson, Carl Schurz carrying a drum on his back labeled "Anti-Expansion Band", and Oswald Ottendorfer carrying a small bag labeled "Staats Zeitung". In the background, William McKinley is riding on a railroad car labeled "Expansion Train" that is racing along railroad tracks, headed for Washington, D.C.
"In a hole; - and no "issue"" by J.S.Pughe. 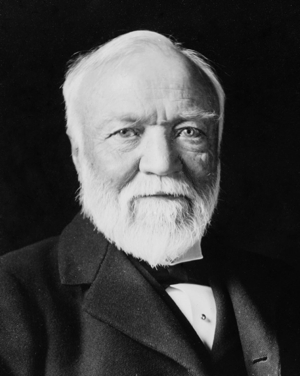 (1899 December 27). 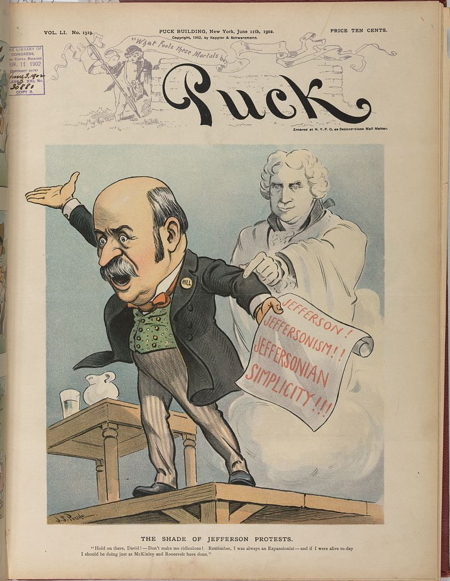 Print shows William Jennings Bryan as the Democratic Donkey with the bit end of a bridle in his mouth, trying to climb out of a hole constructed of blocks labeled "Aguinaldoism, Anti-Trust, Anti-Imperialism, Free Riots, Anti-Expansion, Free Silver, Populism, Calamity Cry, [and] Chicago Platform", with the U.S. Capitol nearby. 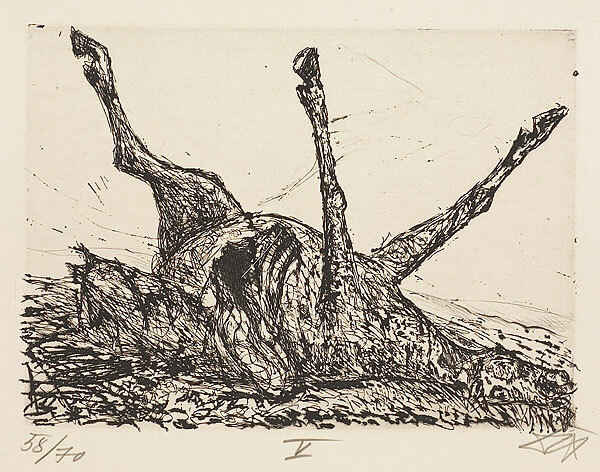 "Declined with thanks" by J.S. Pughe. 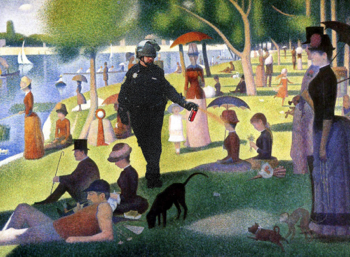 (1900 September 5). 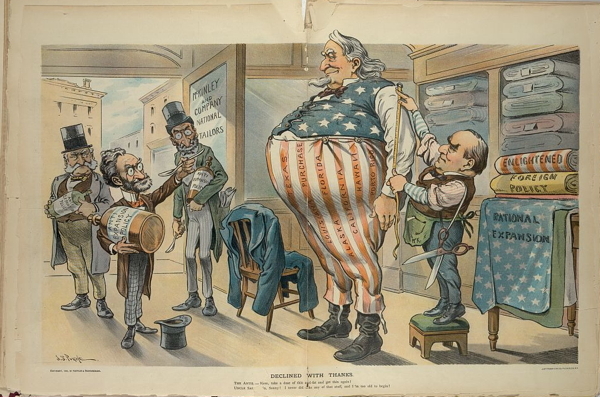 Illustration shows a huge Uncle Sam getting a new outfit made at the "McKinley and Company National Tailors" with President McKinley taking the measurements. 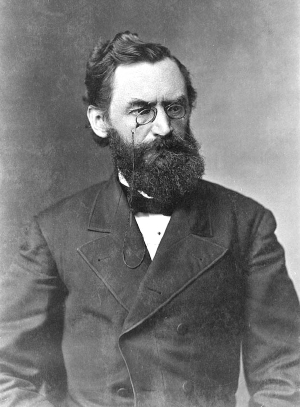 Carl Schurz, Joseph Pulitzer, and Oswald Ottendorfer stand inside the entrance to the shop and Schurz is offering Uncle Sam a spoonful of "Anti-Expansion Policy" medicine, a bottle of which each is carrying. On the right are bolts of cloth labeled "Enlightened Foreign Policy" and "Rational Expansion." The strips on Uncle Sam's trousers are labeled "Texas, Louisiana Purchase, Alaska, Florida, California, Hawaii, [and] Porto Rico." Caption: The Antis. Here, take a dose of this anti-fat and get slim again! Uncle Sam No, Sonny!, I never did take any of that stuff, and I'm too old to begin! 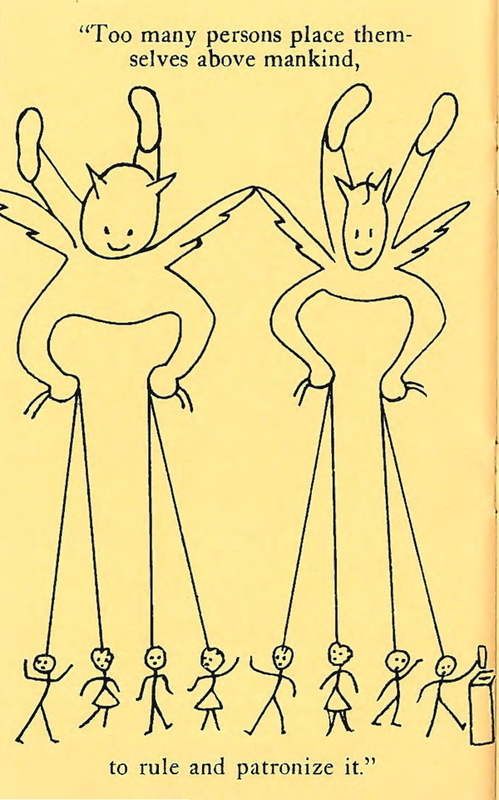 "The spider and the three silly flies" by J.S. Pughe. 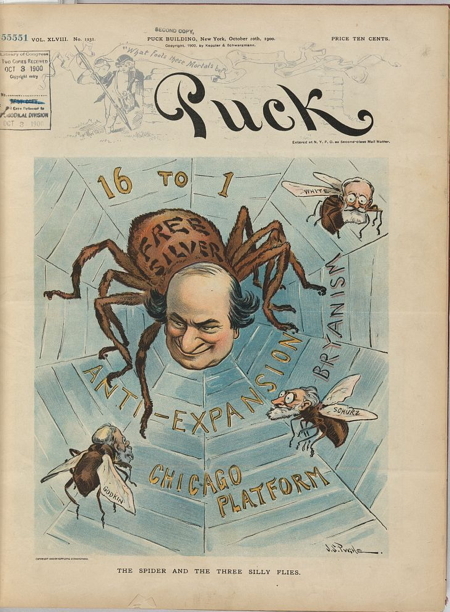 (1900 October 10) Illustration shows William Jennings Bryan as a large spider labeled "Free Silver" with three flies labeled "White, Schurz, [and] Godkin" caught in his web labeled "16 to 1," "Anti-expansion," "Chicago Platform" and "Bryanism." "The Aguinaldo guard" by J.S. Pughe. (1900 October 17). 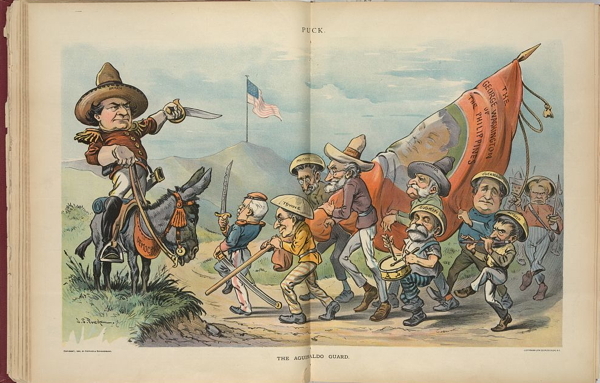 Illustration shows William Jennings Bryan standing in the stirrups of his mount, a donkey labeled "Democracy", directing the honor guard led by Adlai Stevenson, and including Henry R. Towne, Joseph Pulitzer, and Carl Schurz carrying a large flag with a portrait of Emilio Aguinaldo under the heading "The George Washington of the Philippines." 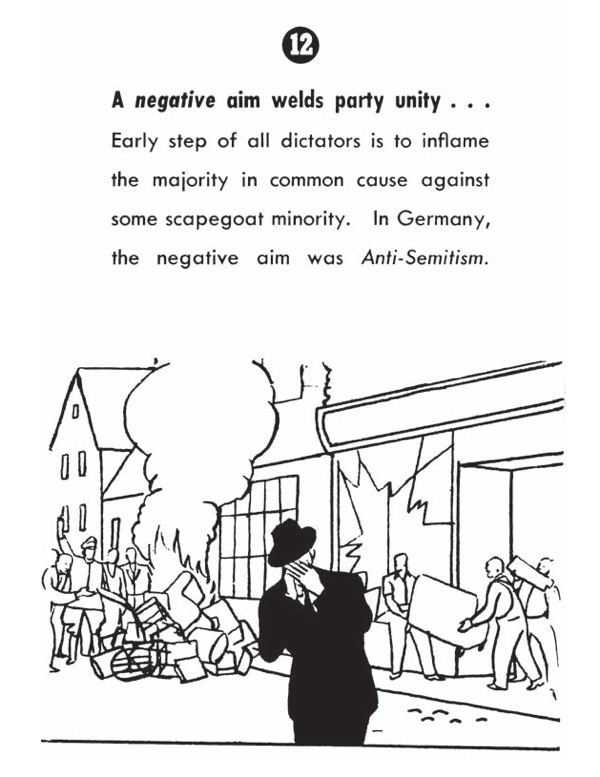 Also included are "Oswald Ottendorfer, Edwin L. Godkin, Bourke Cockran, John Altgeld, and William Sulzer. "Consistency, thou art a jewel!" 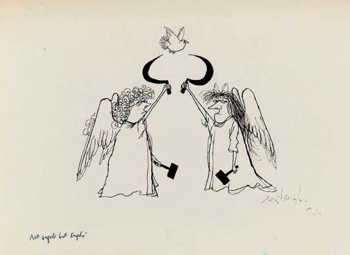 by Louis Dalrymple. (1900 October 24). 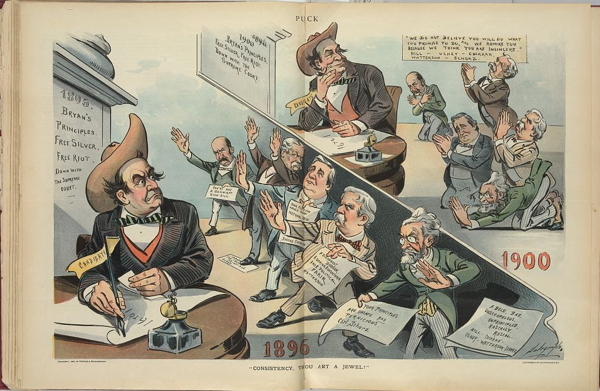 Illustration shows two views of William Jennings Bryan sitting at a desk working on his campaign principles; the lower scene shows Bryan preparing for the 1896 presidential election, to the right are Carl Schurz, Henry Watterson, Bourke Cockran, Richard Olney, and David Hill, all in disagreement with Bryan, each holding a sheet of paper disclaiming his principles. 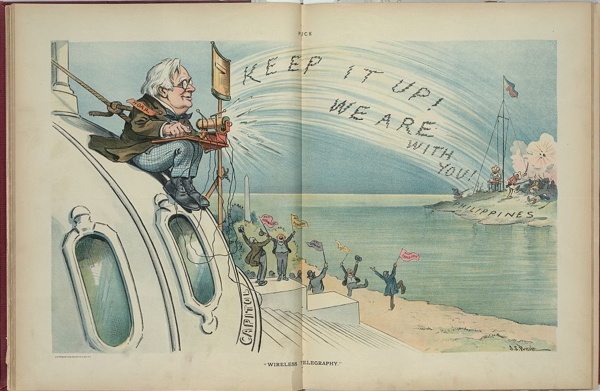 In the upper scene, Bryan has crossed out 1896 and replaced it with 1900, adhering to, and remaining consistent with, his earlier principles; to the right are the same five disclaimers, this time they bow to Bryan and offer only one comment "We do not believe you will do what you promise to do, and we admire you because we think you are insincere. Hill, Olney, Cockran, Watterson, Schurz." "It won't take" by J.S. Pughe. 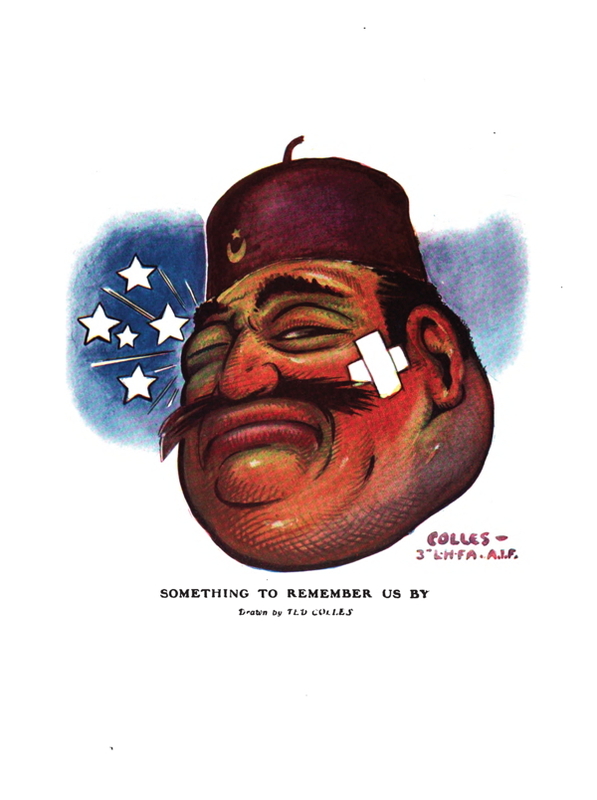 (1900 October 31). 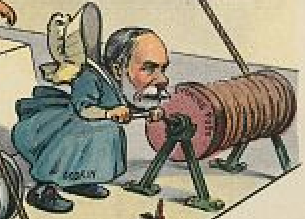 Illustration shows William Jennings Bryan holding a large bellows labeled "Bryanism", which he is using to fan the flames of a small campfire labeled "Imperialism." 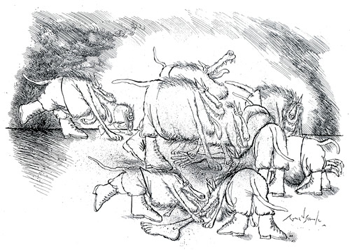 On the left side of the fire is Carl Schurz and on the right, kneeling on the ground, is Adlai Stevenson, they blow on the fire as well, to no affect. 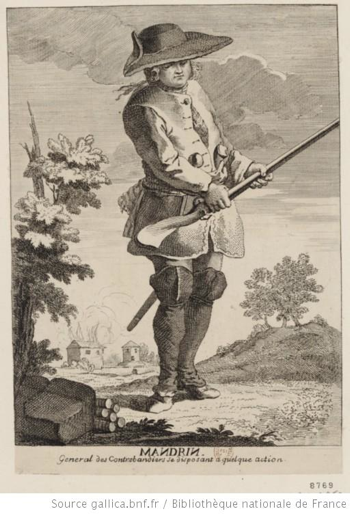 "The real German-American" by Udo Keppler. (1900 October 31). 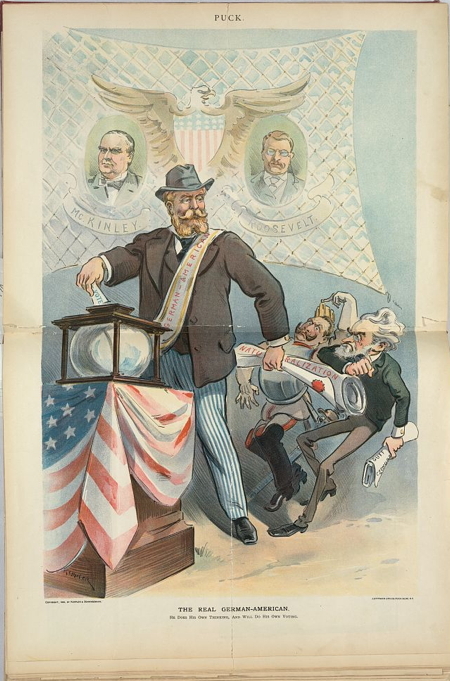 Illustration shows a German American man standing in front of a banner showing bust portraits of President William McKinley and Theodore Roosevelt; as he casts his vote, he uses his left hand, holding papers labeled "Naturalization", to brush aside the German Emperor, William II, and Carl Schurz. 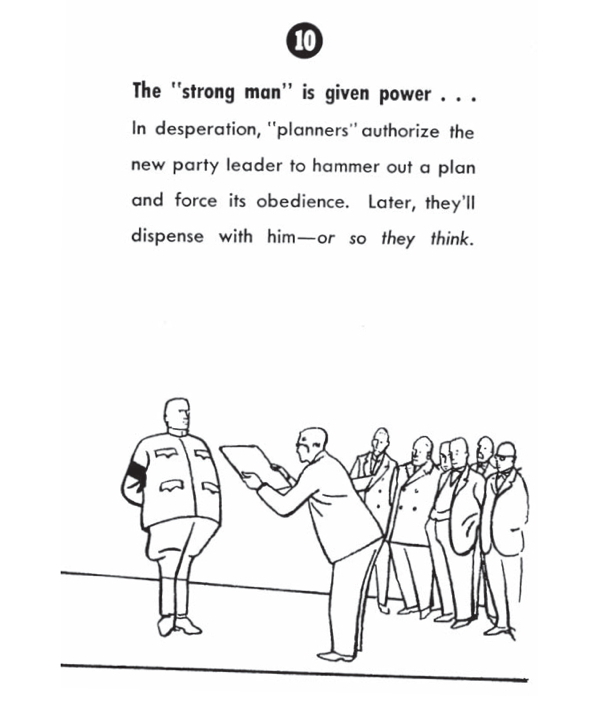 Caption: He does his own thinking, and will do his own voting. 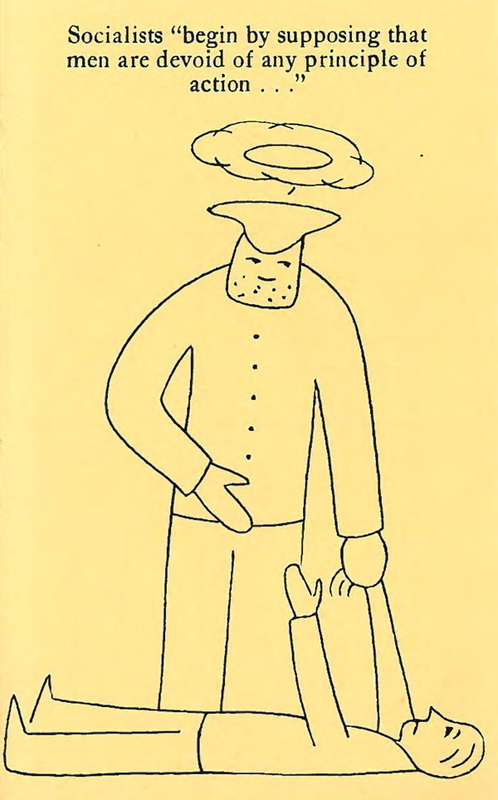 "Columbia's Easter Bonnet" by Ehrhart after a sketch by Dalrymple. 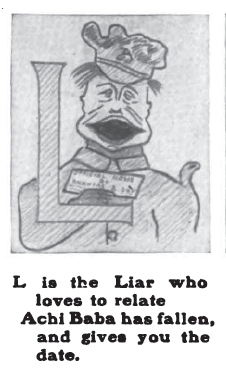 (April 6, 1901). 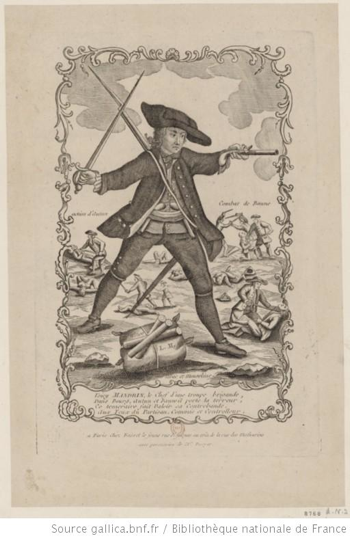 Columbia is wearing a military jacket and is pinning a hat to her hair with a small sword. 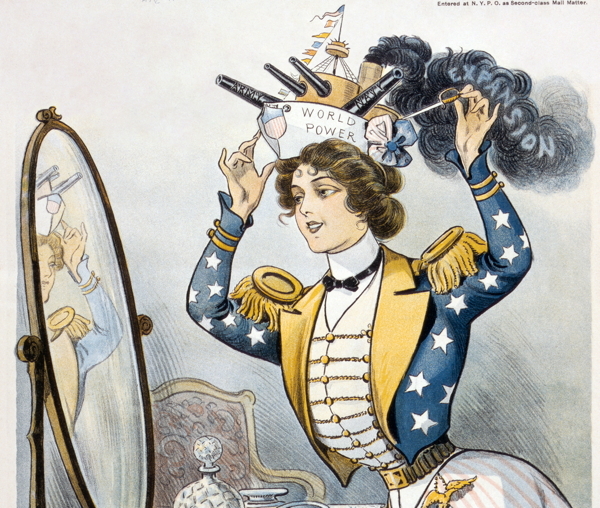 Her hat is in the shape of a battle ship named "World Power" and has cannons named "Army" and "Navy". Black smoke billows from the ship's funnel with the word "Expansion". Around her waist is a chatelaine decorated with an American eagle hanging from which are a small black pistol and a golden bayonnette. 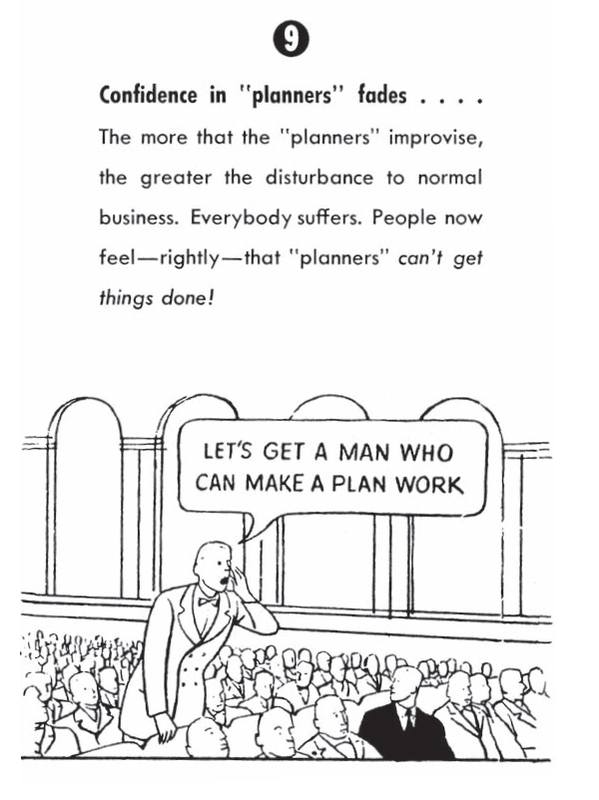 "The lesson of the President's journey" by J.S. Pughe. (1901 May 29). 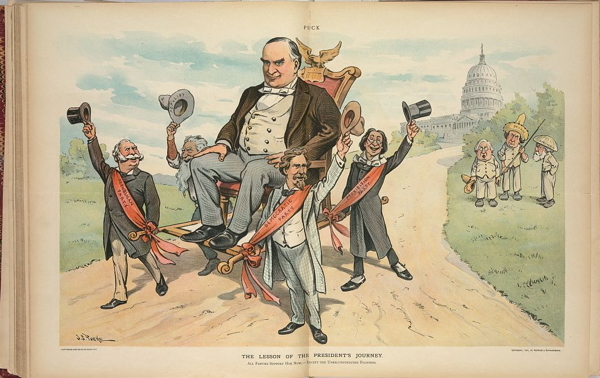 Illustration shows representatives of the "Democratic, Republican, Populist, [and] Prohibition" parties carrying a larger-than-life-sized President McKinley on a sedan chair, and waving their hats as a show of support for McKinley's policies, behind them, on the right, are standing William Jennings "Bryan," George F. "Hoar," and Edward "Atkinson" dressed like Filipinos. In the background is the U.S. Capitol building. Caption: All parties support him now, - except the unreconstructed Filipinos. 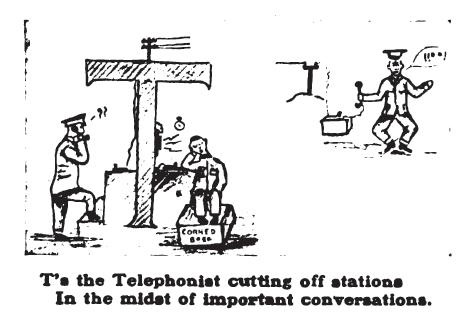 "Wireless telegraphy" by J.S. Pughe. 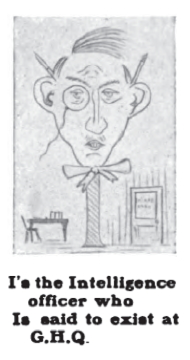 (1902 February 26). 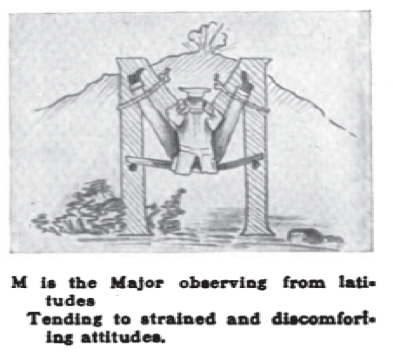 Illustration shows George F. Hoar sitting on the U.S. Capitol dome using a telegraph to send a "wireless" message "Keep it up! We are with you!" across a body of water to the insurgent forces fighting against American troops in the Philippines; at the base of the Capitol are several men waving "Anti-Expansion" banners. 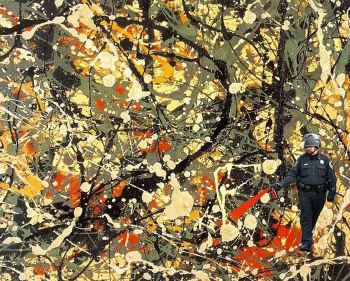 "The flag must "stay put"" by J.S. Pughe. 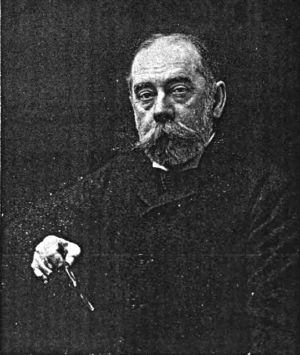 (1902 June 4). 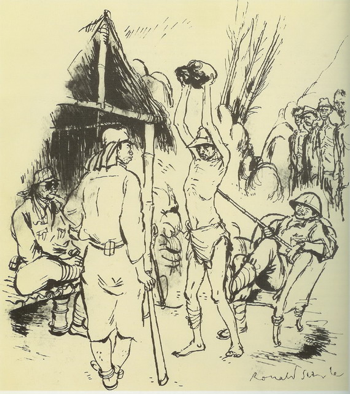 Illustration shows George F. Hoar, Carl Schurz, David B. Hill, and former Massachusetts Governor George S. Boutwell, anti-expansionists, placing their "Anti-Expansion Speech" at the feet of a huge American soldier holding a rifle and the American flag, while opposite them Filipinos place guns and swords at the soldier's feet. Caption: The American Filipinos and the Native Flipinos will have to submit. 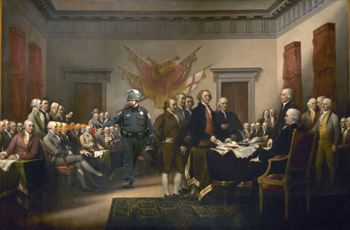 "The shade of Jefferson protests" J.S. Pughe. (1902 June 11). 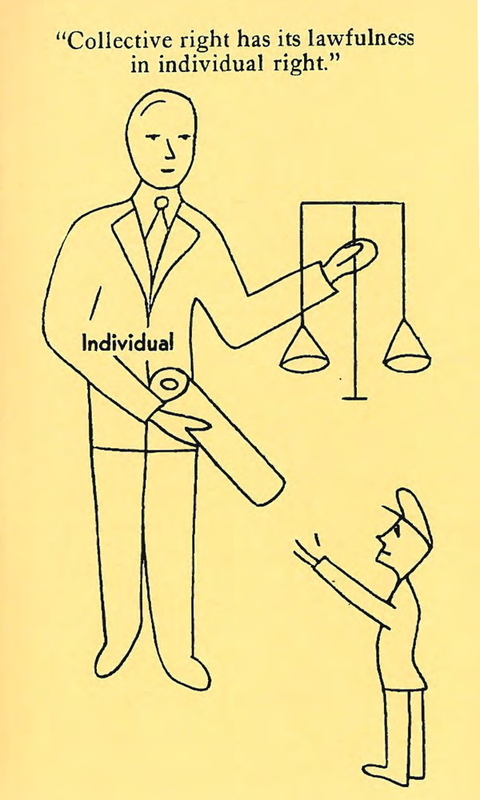 Illustration shows David B. Hill standing on a platform, speaking to an unseen audience; he holds a paper that states "Jefferson! Jeffersonianism!! Jeffersonian Simplicity!!!" The ghost of Thomas Jefferson is tapping him on the elbow. Caption: "Hold on there, David! - Don't make me ridiculous! Remember, I was always an Expansionist - and if I were alive to day I should be doing just as McKinley and Roosevelt have done." 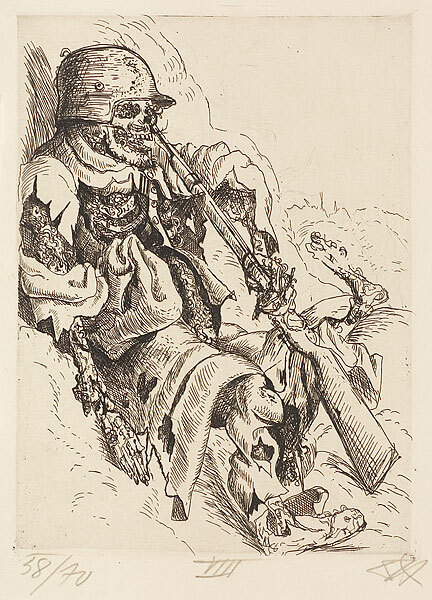 "Last stand of the anti-imperialist" by Udo Keppler. (1902 August 27). 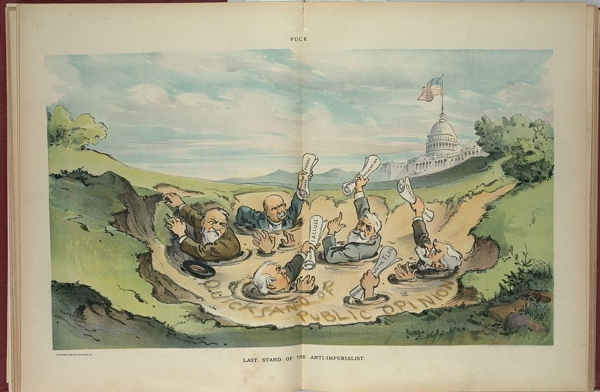 Illustration shows anti-imperialists George F. Hoar, Carl Schurz, Edward Atkinson, Charles Francis Adams, Jr., and Andrew Carnegie drowning in "Quicksand of Public Opinion" with the U.S. Capitol building in the background. 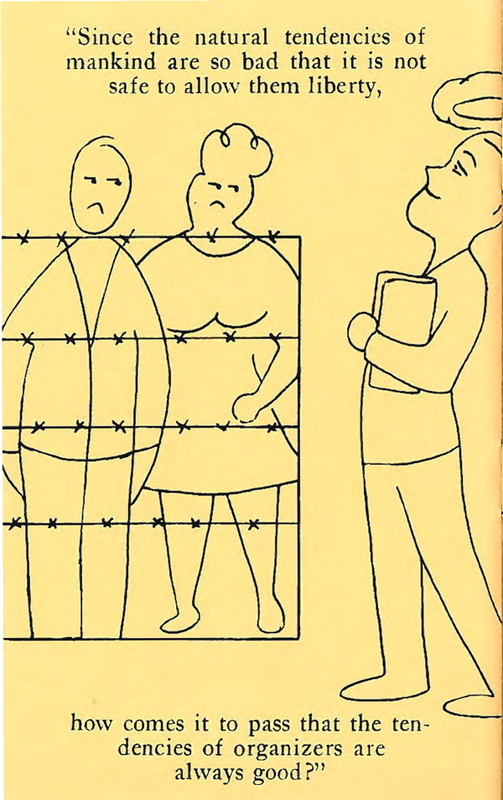 "St. Louis's object lesson to anti-expansionists" by Udo Keppler. (1903 April 15). 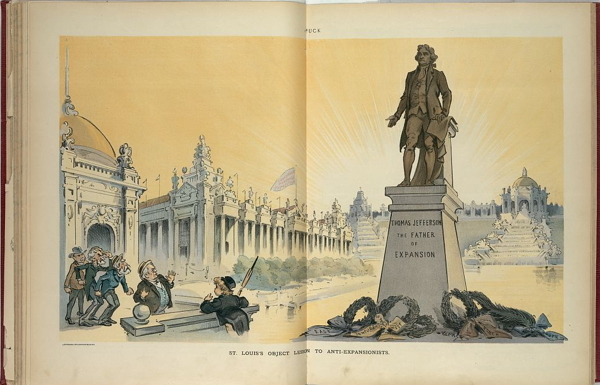 Illustration shows a statue of Thomas Jefferson labeled "Thomas Jefferson The Father of Expansion" at the Louisiana Purchase Exposition in Saint Louis, Missouri, with Puck directing the attention of George F. Hoar and other anti-expansionists Edward Atkinson, Carl Schurz, and Charles F. Adams who look on in disbelief. 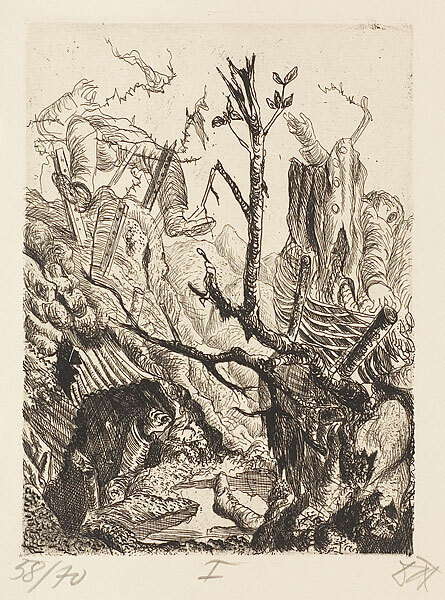 Here is a selection of 14 of the 50 drawings which the German artist Otto Dix (1891–1969) published in 1924. 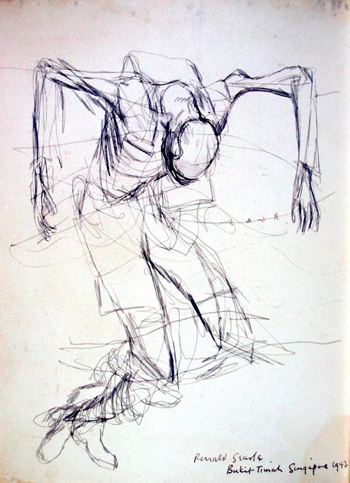 See the complete collection of drawings here (with different sizes for each image). 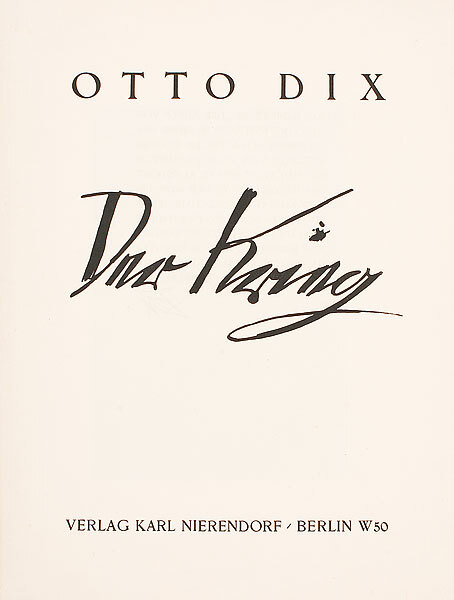 See also my Study Guide on Otto Dix for a discussion of this and some other works of art. 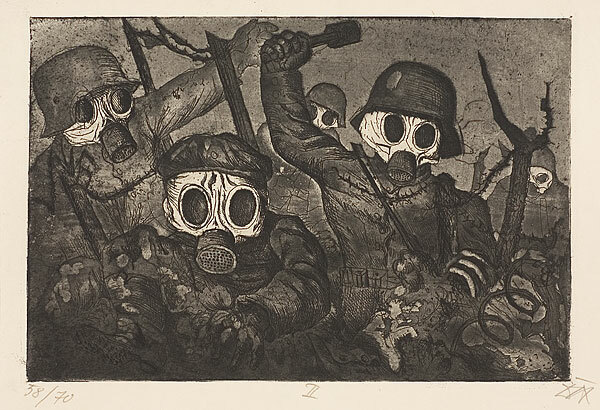 Source: Otto Dix, Der Krieg (The War) (Berlin: Otto Felsing, Karl Nierendorf, 1924). The are 50 drawings with 10 Mappe (Portfolios) with 10 drawings in each. 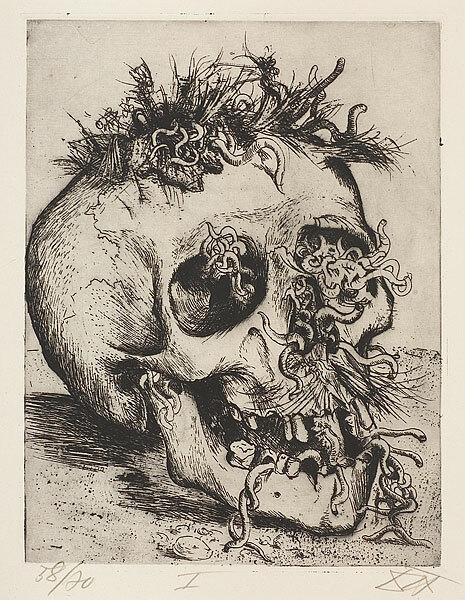 Image source: National Gallery of Australia <http://nga.gov.au/Home/Default.cfm>. 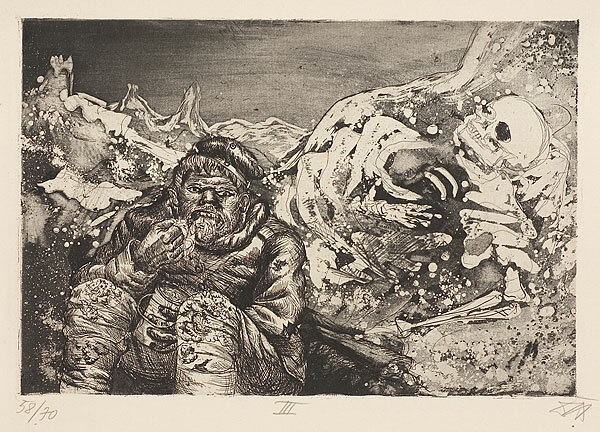 Otto Dix Collection . 46. 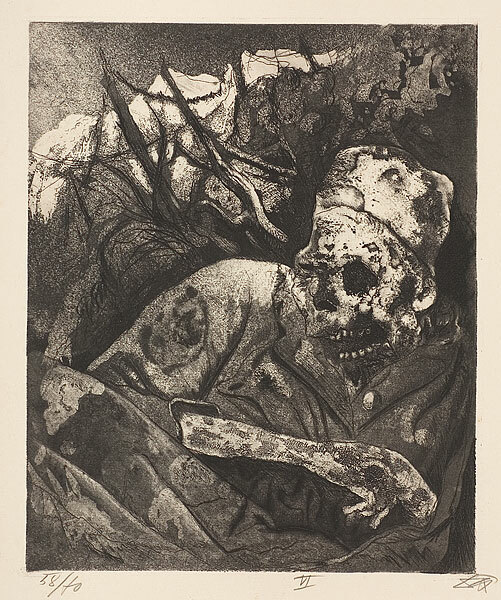 Wounded Man (Autumn 1916, Bapaume) [Verwundeter (Herbst 1916, Bapaume)]. 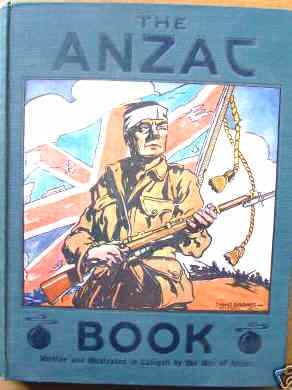 The Anzac Book. 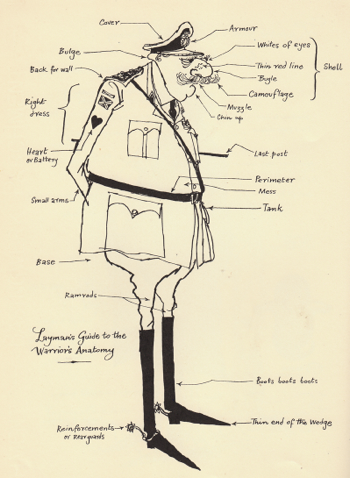 Written and Illustrated in Gallipoli by The Men of Anzac. 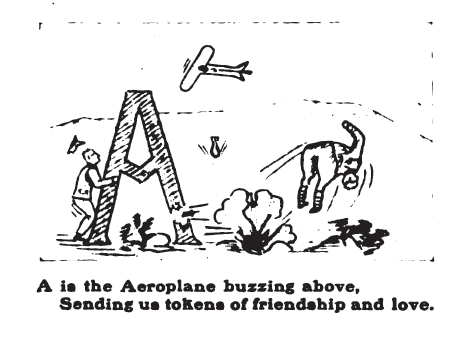 For the benefit of Patriotic Funds connected with the A.& N.Z.A.C. (London, New York, Toronto and Melbourne, 1916). Introduction by Sir W.R. Birdwood, pp. 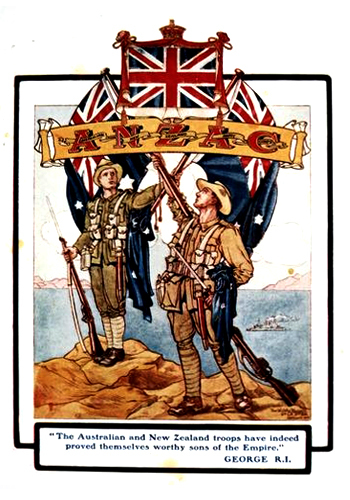 ix-x (ANZAC December 19, 1915). 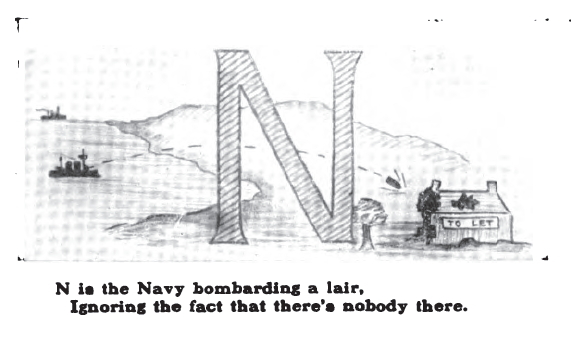 "Editor's Note" by The ANZAC Book Staff (Aegean Sea, December 29, 1915). 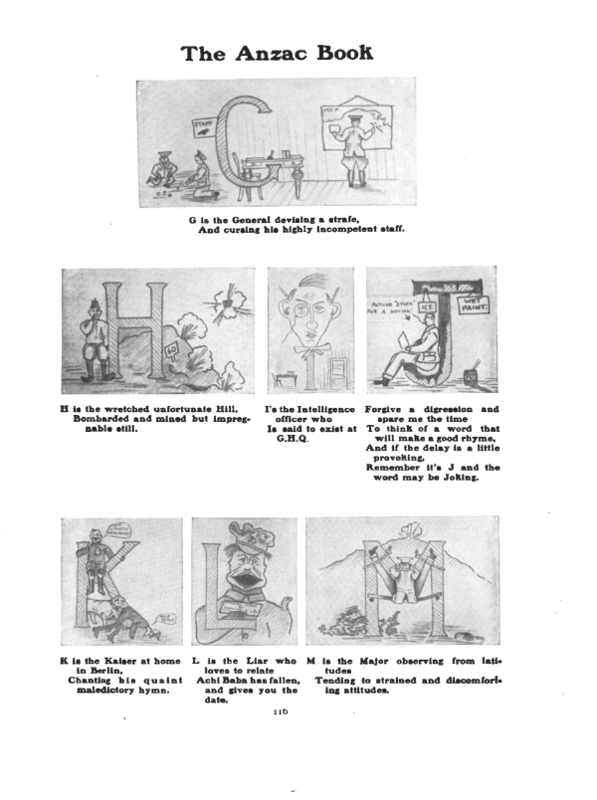 "An ANZAC Alphabet" by Henderson is one of the best loved illustrations in the ANZAC Book (pp. 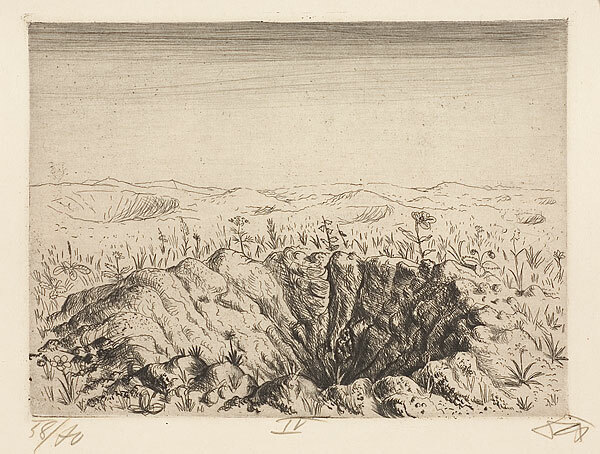 115-18). 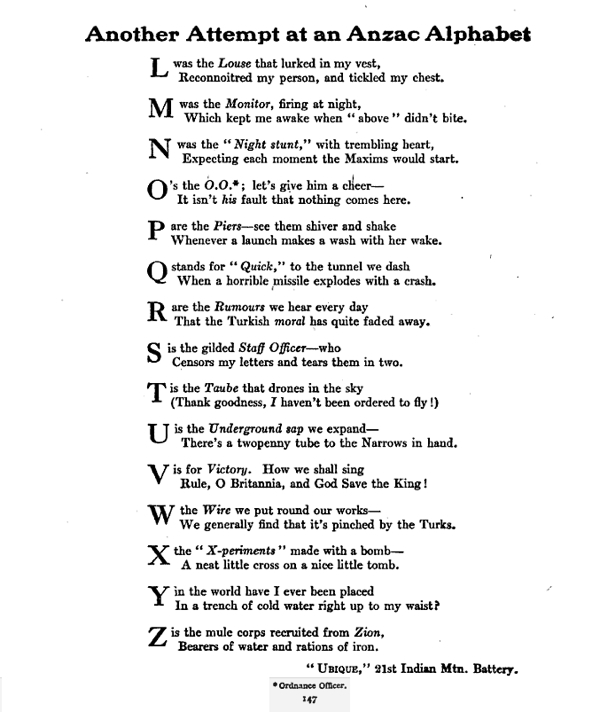 It is a 4 page rhyming poem based upon the letters of the alphabet with rather crude illustrations of each letter of the alphabet along with a two line poem which illustrates various aspects of the soldiers' life at Gallipoli. 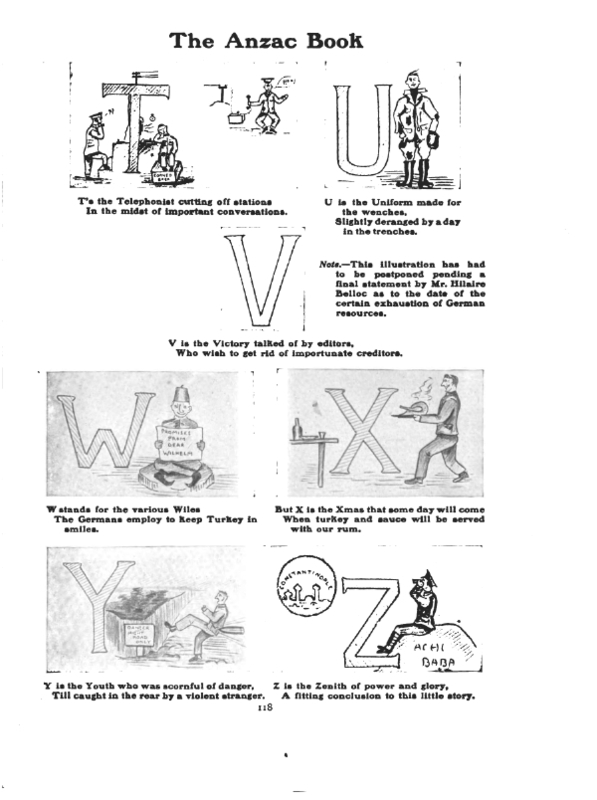 This was not the only ANZAC alphabet which appeared in the ANZAC Book A second one "Another Attempt at an ANZAC Alphabet" (by "Ubique" [Latin for "everywhere"]) appeared a few pages later (pp. 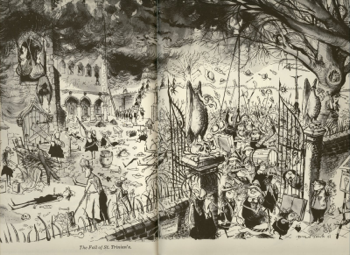 146-47) but it was not illustrated and is less well known. It takes a roughly chronological approach to relating his experiences at Gallipoli and focuses more on the everyday hardships and fear faced by the soldiers. 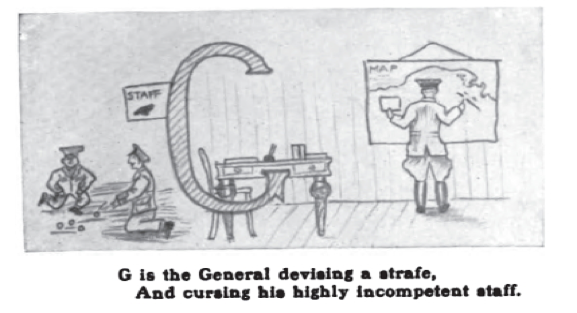 I will display the Alphabets in three separate posts: a general overview of both; and a separate one for each of the Alphabets. 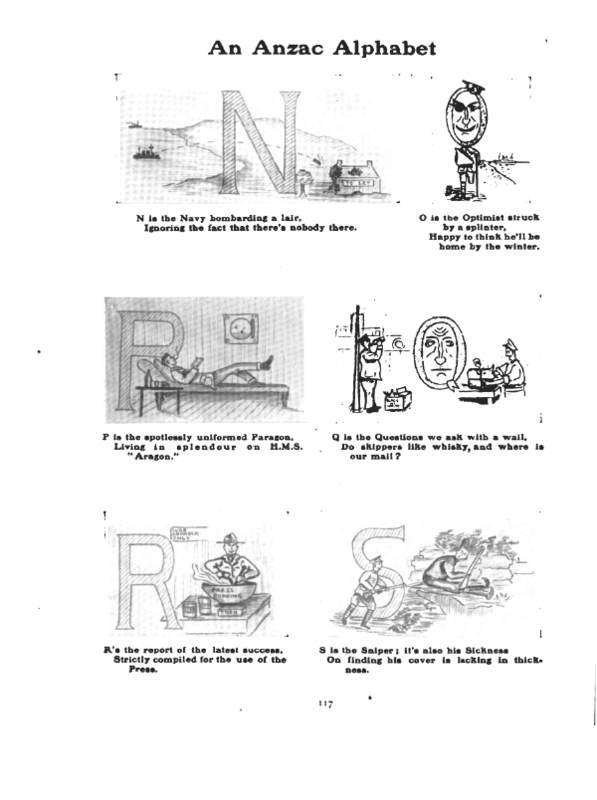 The Henderson Alphabet will contain many images - of each page in the ANZAC Book and then the individual letters of the alphabet. 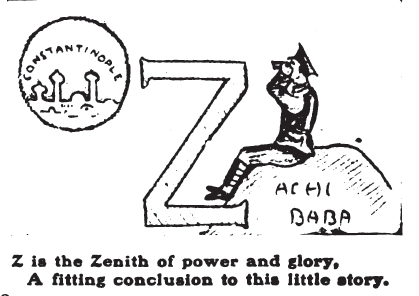 Another Attempt at an ANZAC Alphabet (by "Ubique," 21st Indian Mtn. Battery) [pp. 146-47]. When I saw the remarkable look of the place. Punctured the funnel and gave me the "pip." As I jumped from a lighter and fell on the beach. When fragments of shrapnel came whizzing my way. As I woke in the morning and crawled from my lair. Who feed on a fellow wherever he lies. The result of commodities packed in a tin. It would take me an hour to fill in with a spade. Before I was taught to take cover instead. We found it was almost invariably "Plum." 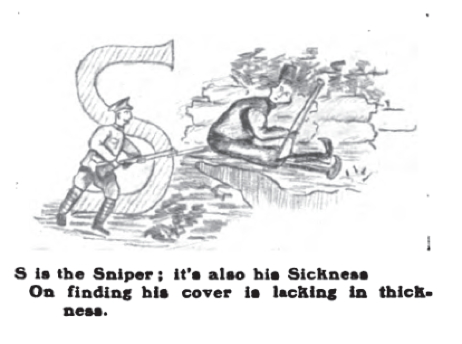 Of hiding whenever the enemy fired. Reconnoitred my peson and tickled my chest. Which kept me awake when “above” didn’t bite. Expecting each moment the Maxims would start. It isn’t his fault that nothing comes here. Whenever a launch makes a wash with her wake. When a horrible missile explodes with a crash. That the Turkish moral has quite faded away. Censors my letters and tears them in two. There’s a twopenny tube to the Narrows in hand. 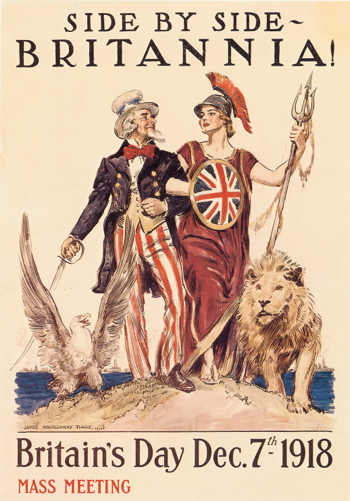 Rule, O Britannia, and God Save the King! We generally find that it’s pinched by the Turks. A neat little cross on a nice little tomb. In a trench of cold water right up to my waist? Bearers of water and rations of iron. "Ubique," 21st Indian Mtn. Battery. 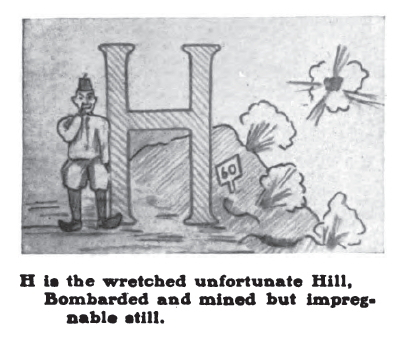 The Henderson ANZAC Alphabet: An ANZAC Alphabet, by J.W.S. 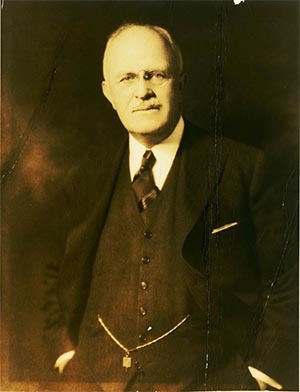 Henderson, R.G.A. [pp. 115-18]. 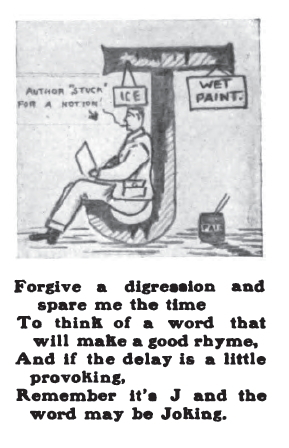 First I will show images of the pages as they appeared in the original book, then images of the individual letters and their accompanying poem. Please see the previous post for a text only version of the poem. 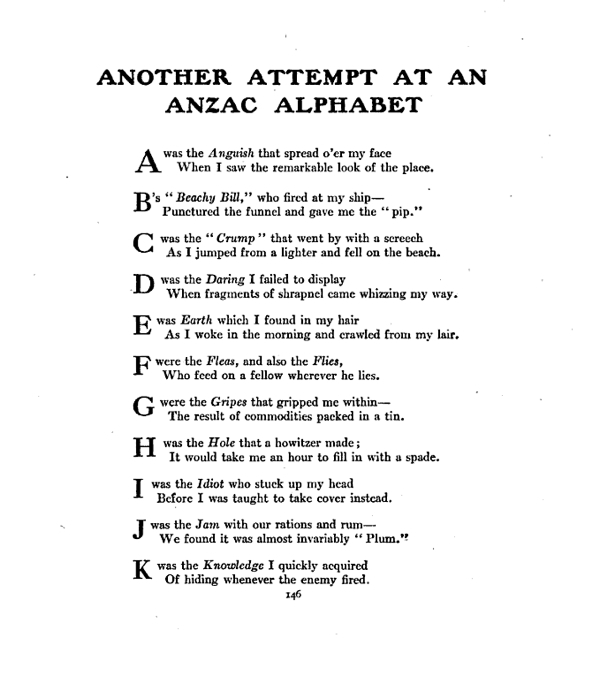 An ANZAC Alphabet, by J.W.S. 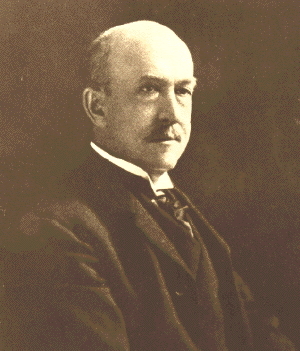 Henderson, R.G.A. [pp. 115-18]. Sending us tokens of friendship and love. 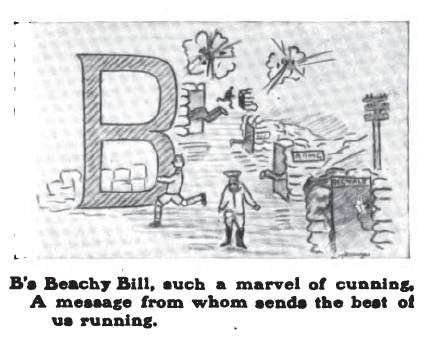 A message from whom sends the best of us running. 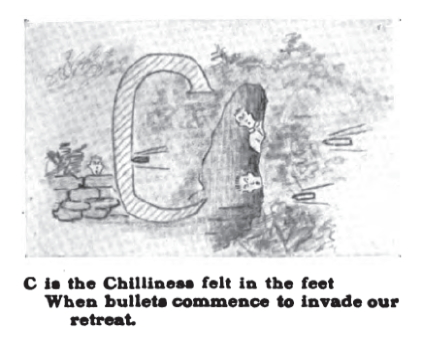 When bullets commence to invade our retreat. Working in hopes of defeating the climate. Employed by the man who is keen on promotion. 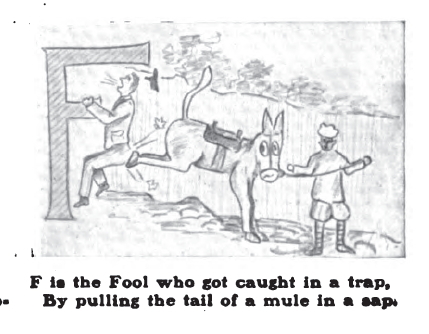 By pulling the tail of a mule in a sap. And cursing his highly incompetent staff. Bombarded and mined but impregnable still. Is said to exist at G.H.Q. Remember it's J and the word may be Joking. 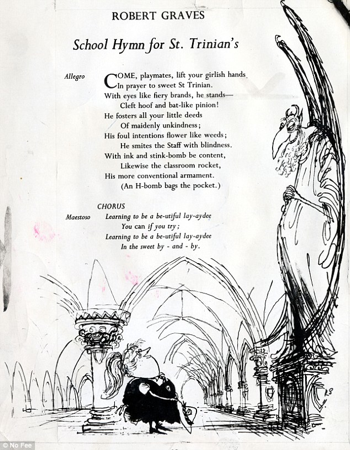 Chanting his quaint maledictory hymn. Achi Baha has fallen, and gives you the date. Tending to strained and discomforting attitudes. Ignoring the fact that there's nobody there. Happy to think he'll be home by the winter. 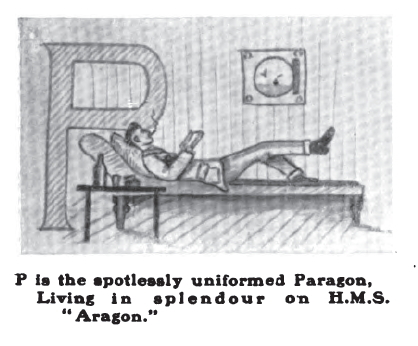 Living in splendour on H.M.S. "Aragon." 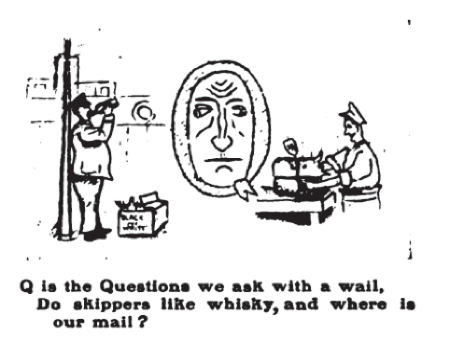 Do skippers like whisky, and where is our mail? Strictly compiled for the use of the Press. On finding his cover is lacking in thickness. In the midst of important conversations. 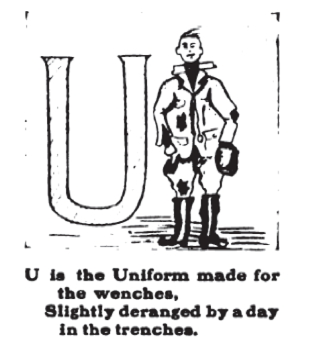 Slightly deranged by a day in the trenches. Who wish to get rid of importunate creditors. 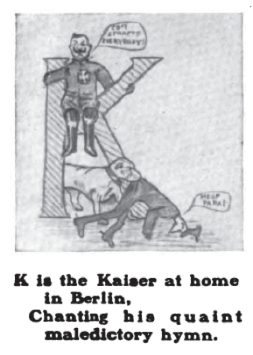 certain exhaustion of German resources. 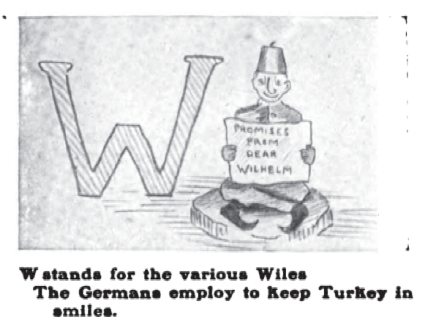 The Germans employ to keep Turkey in smiles. When turkey and sauce will be served with our rum. Till caught in the rear by a violent stranger. A fitting conclusion to this little story. 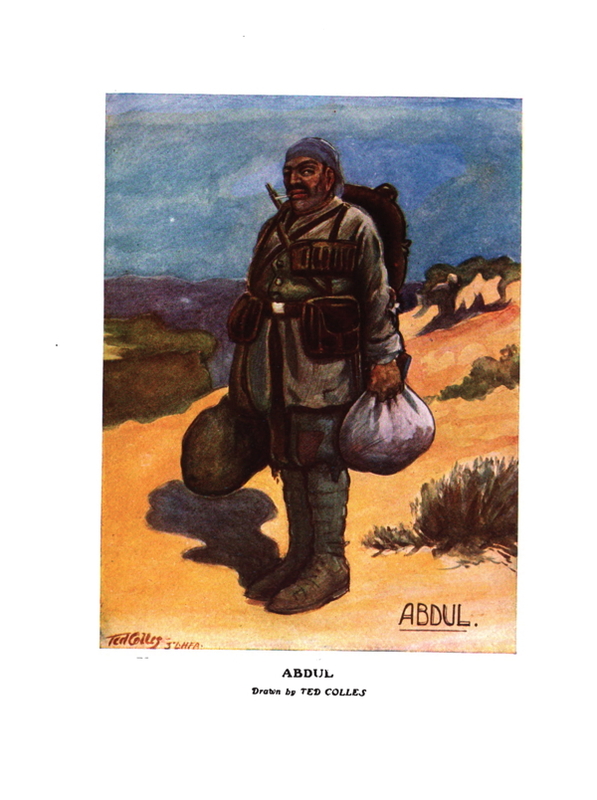 This is a famous book created by some of the Australian and New Zealand soldiers who landed at Gallipoli [now Gelibolu] in Turkey on 25 April 1915. It was part of a British and French attempt to knock the Ottoman Empire (allied with Germany and Austria) out of the war and to relieve the Russian Empire fighting on the eastern front. 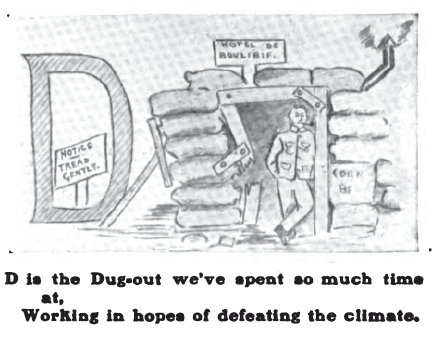 It failed to achieve these objectives and the soldiers were withdrawn by 9 January, 1916. 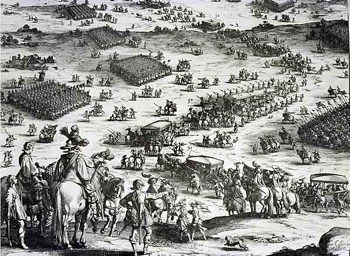 The invading forces had 44,092 men killed and the defending Turks lost 86,692 men killed. 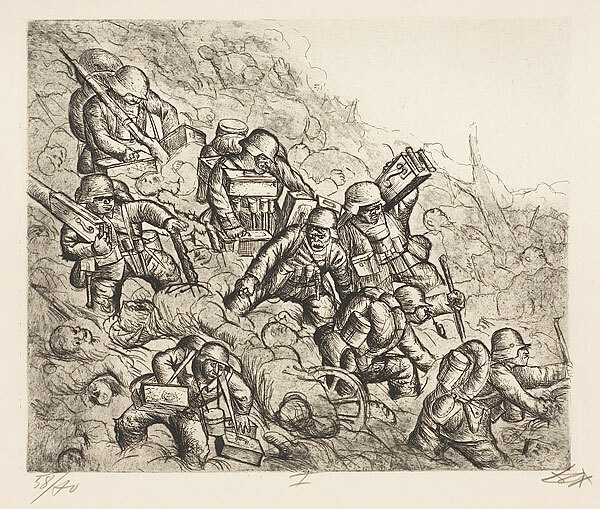 Of these deaths, the ANZAC forces lost 11,430 men killed (Australia 8,709 and NZ 2,721). Given the very low population of both the countries the death toll was seen as quite heavy. 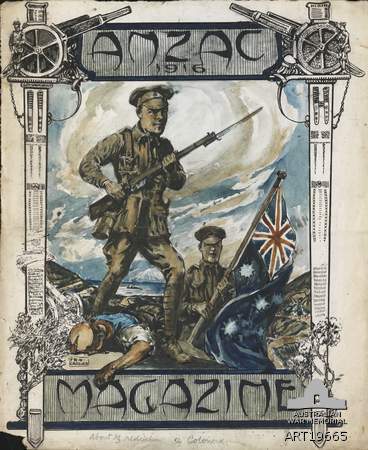 The book was compiled in late November in order explicitly to raise money for the war effort but with the additional, unstated goal of telling the world about how the ANZACs had coped in battle. 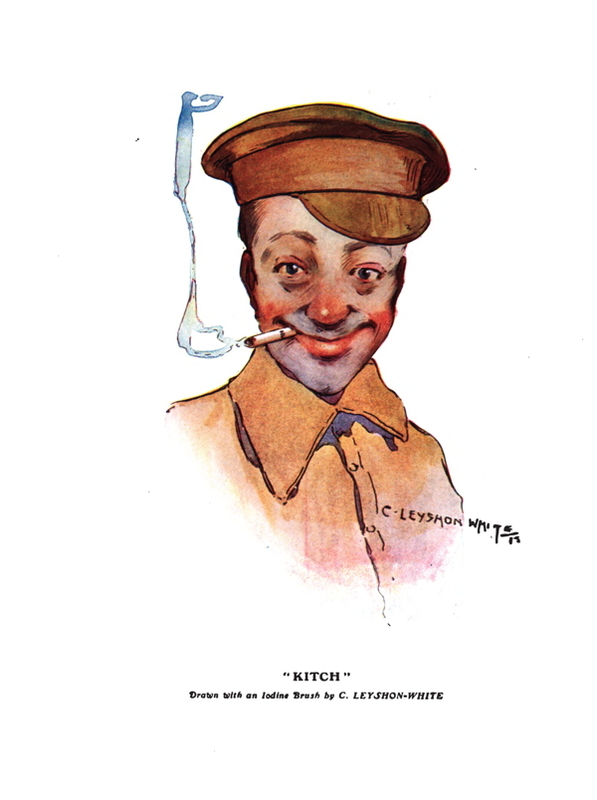 It contains material by both officers and men, including C.E.W. Bean who is listed as one of the editors. He later went on to write a famous official history of Australian involvement in WW1 and helped establish the "ANZAC myth" in Australian history. 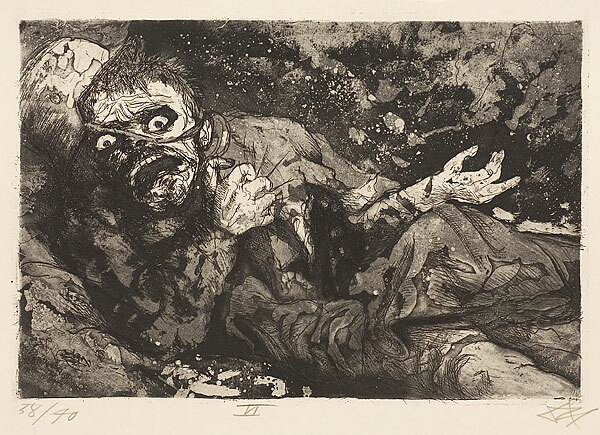 Some of the material expresses frustration and even anger at some of the things that the enlisted men had to endure but this is rather muffled as I'm sure military censorship would have been very much in the back of their minds, as well as a fear of "letting down" their families back home. 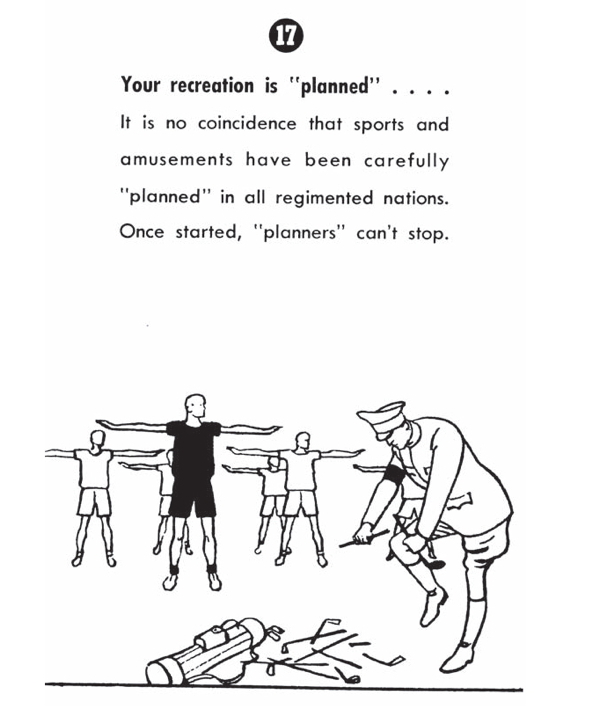 Publication was delayed because while the book was being edited the troops learned of plans to withdraw them early in the new year. 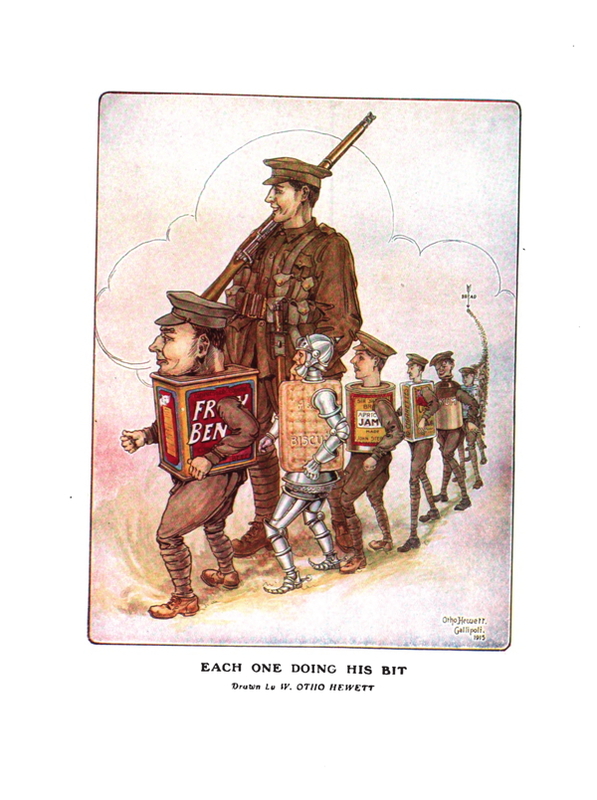 This, in some respects the ANZAC Book became a farewell from the troops after enduring 9 months of fruitless combat. The version of the book I got from Google also contains 2 other separate books of NZ material of a very similar nature. 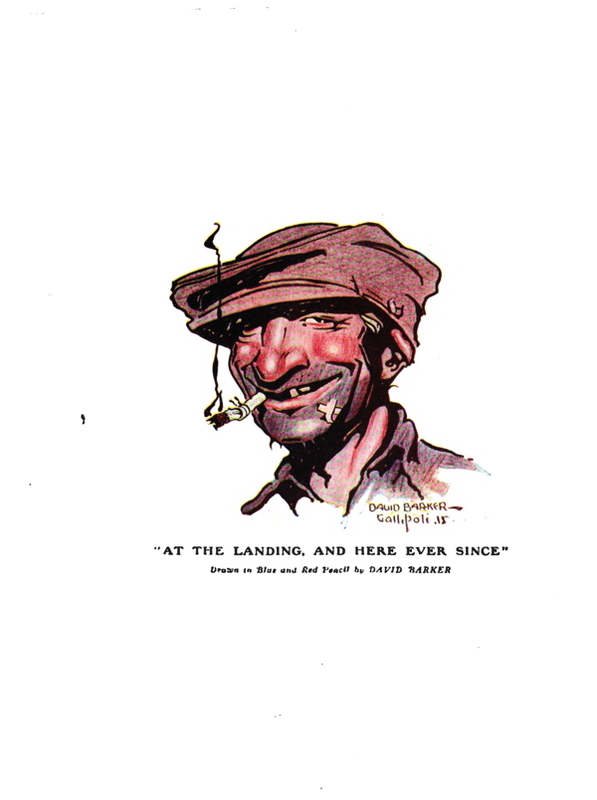 They are dated 1917 and 1918. If I make time I will post them online as well as they are most interesting. 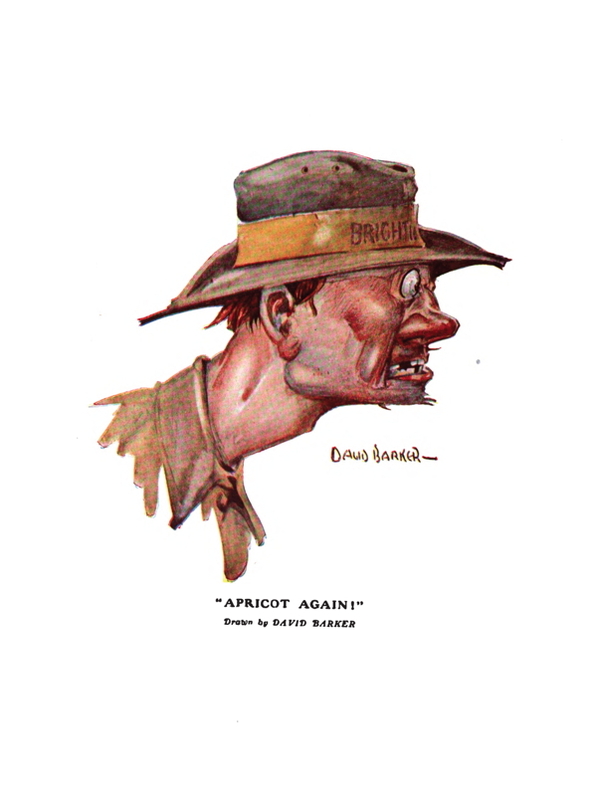 There are many images of Kiwis and a few Koalas which is how the artists distinguished between the 2 groups of soldiers. This brief essay will be in two parts. The first will show the complete set of the 8 coloured plates which were used in the 200 page book. 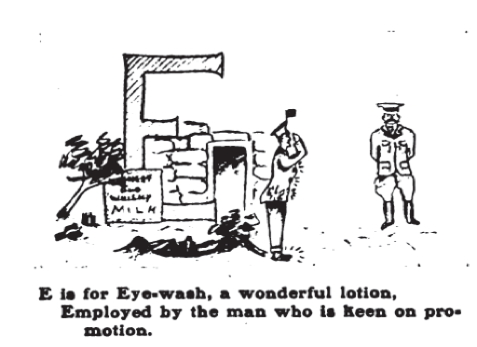 The second part will contain a selection of the other black and white cartoons and illustrations which provide some insight into the minds of the men who were present at Gallipoli in 1915. 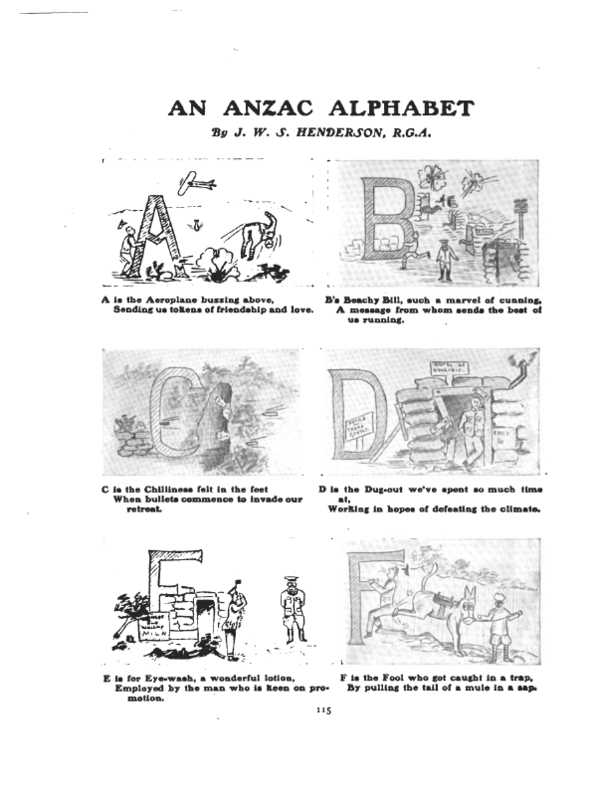 I will also include the quite famous drawings of the "ANZAC Alphabet". 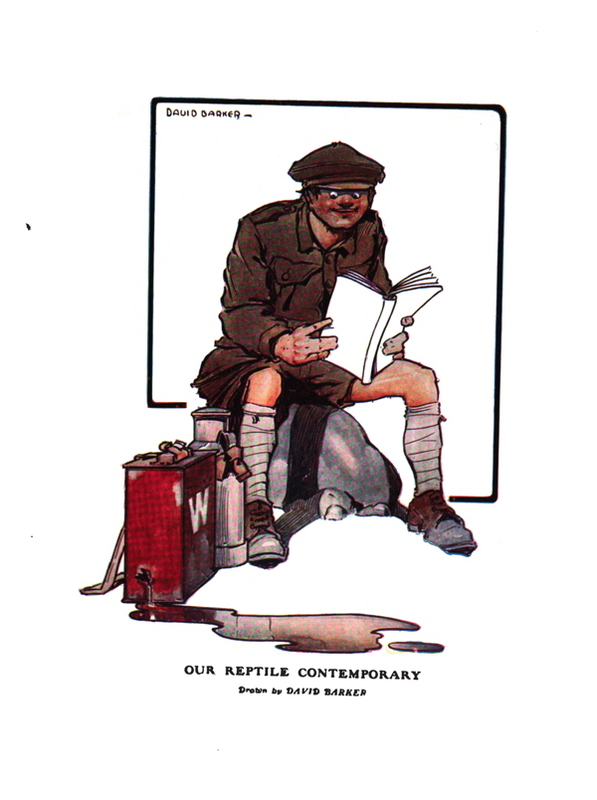 Here are a couple of interesting illustrations which i suggest are trying to tell us another story about the ANZAC experience in the face of the military censors who no doubt would tolerate humour and some mild criticism but nothing stronger than that. 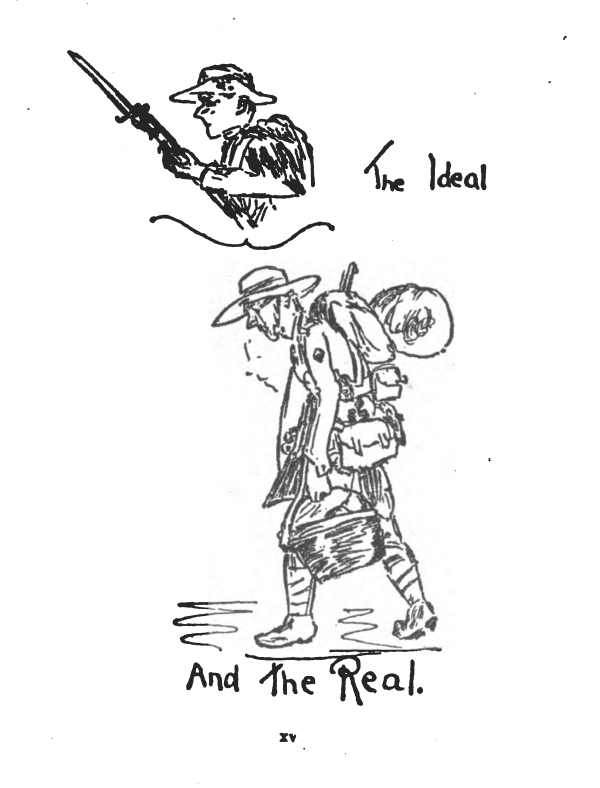 At the end of the "Editor's Note" (perhaps which many would not read very closely) there is a pair of illustrations which suggest that reality was quite different from the ideal view of sacrifice and combat which the troops would have learned at school and basic training. 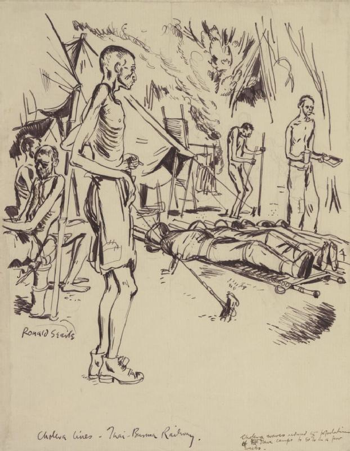 A common image throughout the work is that of the soldiers as mere beasts of burden or "donkeys" The second image appears at the very beginning of the book and shows a fairly cheeky soldier with a cigarette on his lips, looking a bit angry, and carrying a bandaged eye. 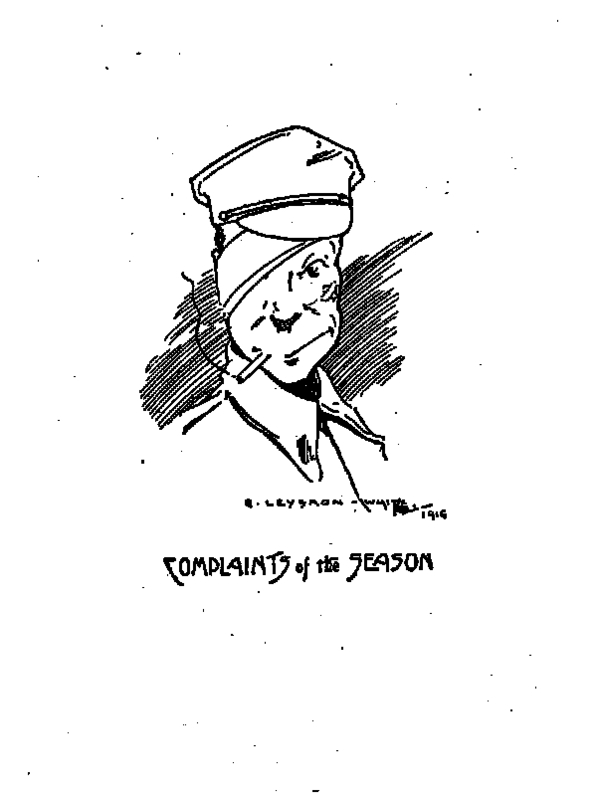 The slogan is not "Season's Greetings" which one might have expected in a book published at Christmas time in 1915 but a more confrontational "Complaints of the Season." 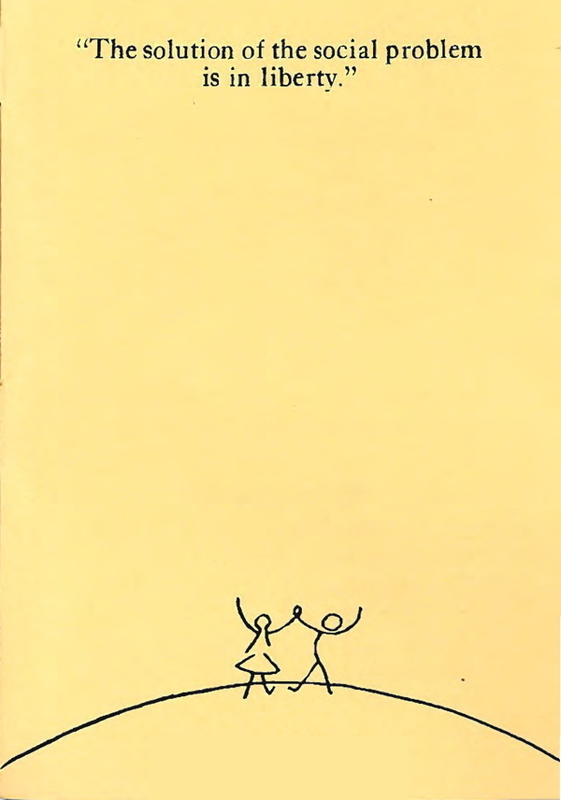 A third piece of evidence is the cover of the book, an image of which can be found at the top of this post. 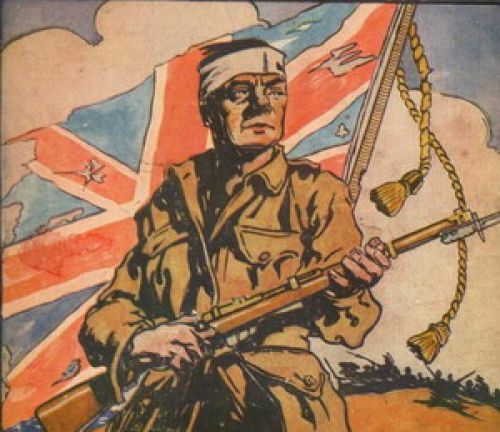 Here we see a very battered but determined looking digger with a bandaged head, standing before a bullet-ridden Union Jack (the Aussies did not have their own flag at this time). 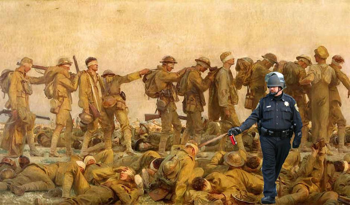 The army of the Empire had taken a beating at Gallipoli and the picture shows it. The Institute for Economic Affairs in London produced a very nice edition which combines this and other versions into one book: Friedrich A. Hayek, The Road to Serfdom with The Intellectuals and Socialism. 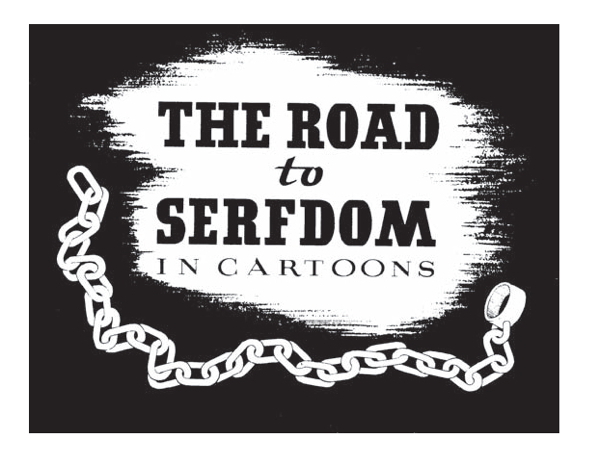 The Condensed Version of The Road to Serfdom by F.A. 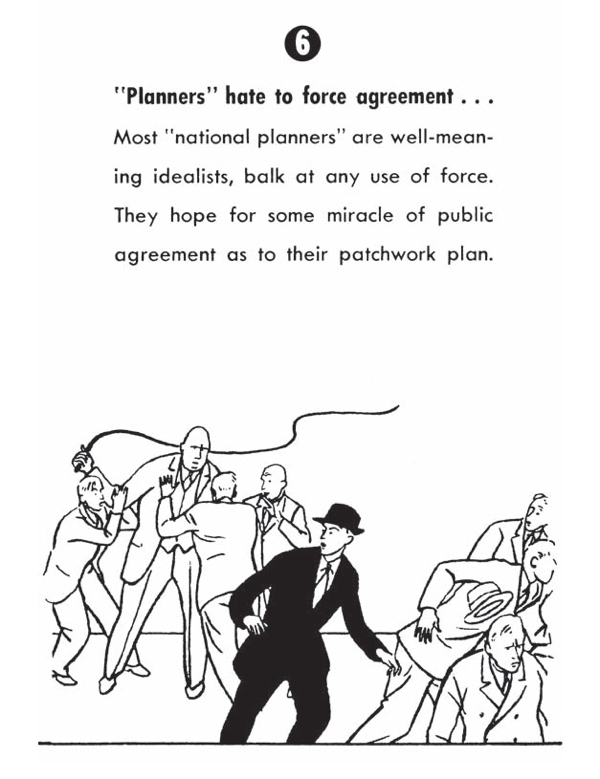 Hayek as it appeared in the April 1945 edition of Reader's Digest (London: The Institute for Economic Affairs, 2005). 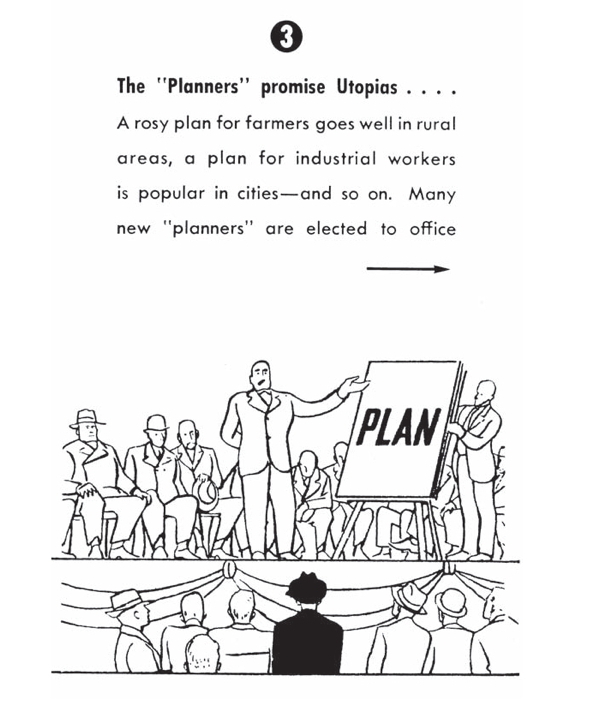 As you can see from the illustrations the depiction of the "planners" draws from the historical example of the Nazi Party (arm bands and jack boots). 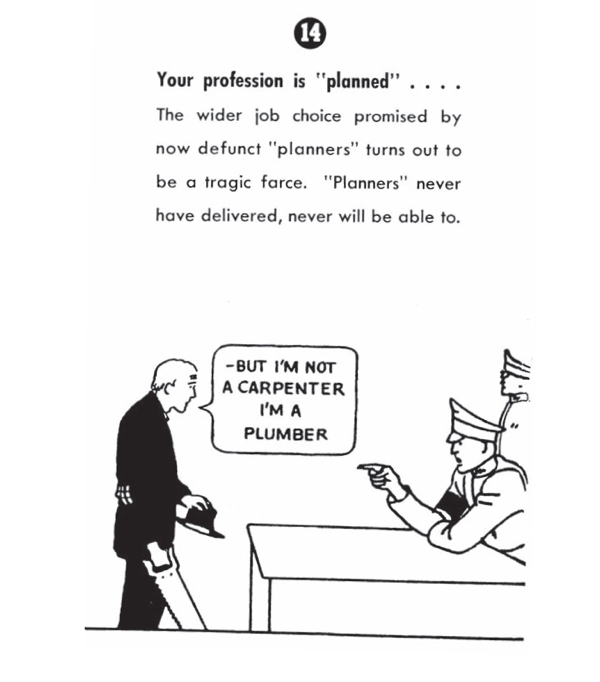 If the illustrated version sere to be updated to the present the artist would no doubt draw the "planners" in business suits which is the uniform worn by the current generation of planners and regulators. 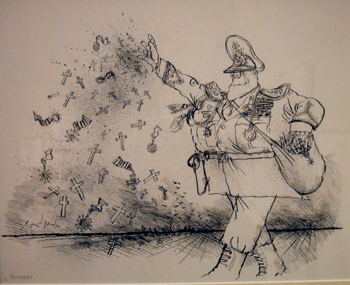 The politicians and bureaucrats of today think that if they wear the uniform of the businessman and not the Gauleiter we won't notice the difference. 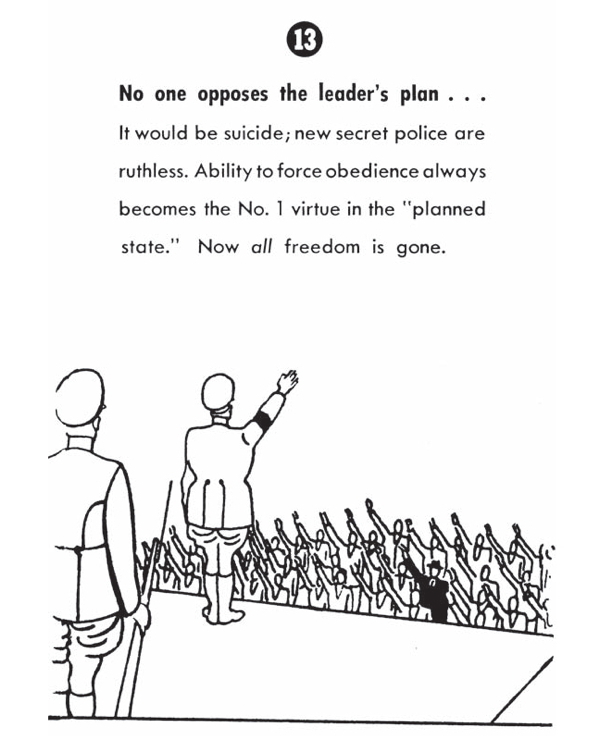 Another major difference is the concluding illustration. 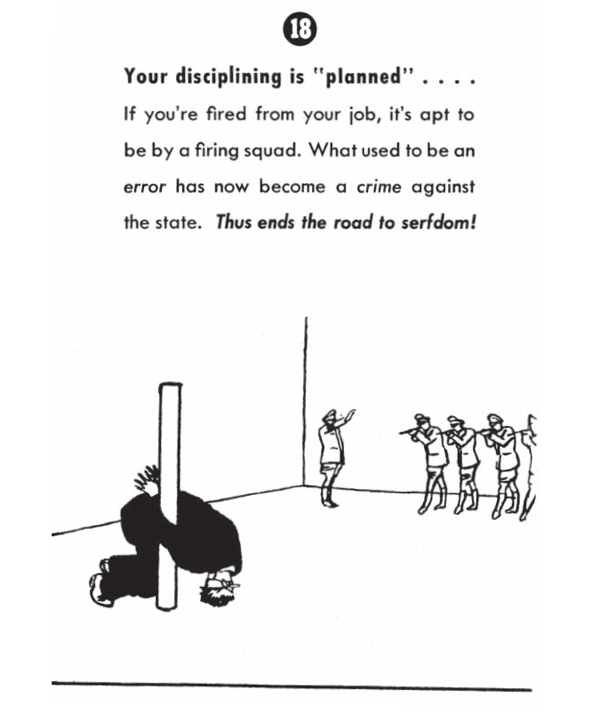 In 1944-45 it might have seemed that the inevitable result of government planning of the economy would be the firing squad for any dissenters or rebels. We now know that this is rather overwrought. After 70 years of government planning, inflation, and growing debt we know that this is not necessary for the state to maintain its rule. 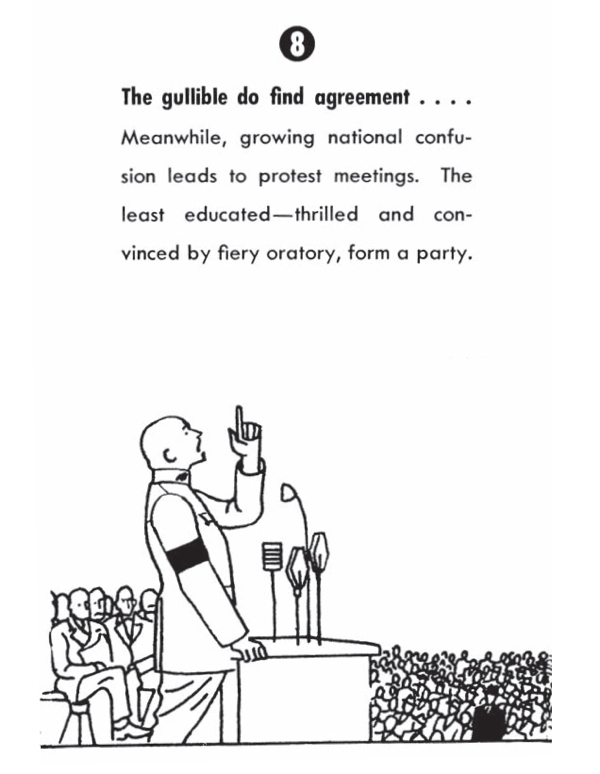 The old Roman strategy of "bread and circuses" for the masses seems to work every time. We can and have been bought off repeatedly. 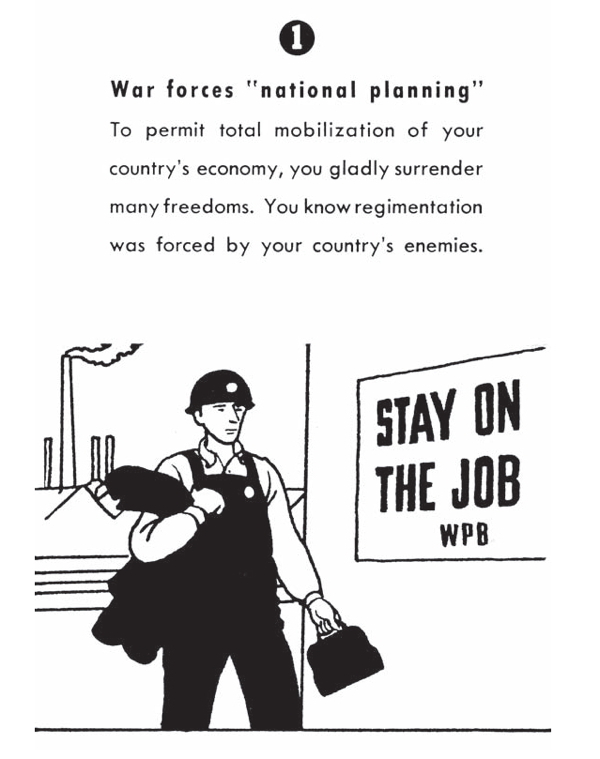 The "serfdom" of the modern welfare/warfare state is a much softer kind of serfdom to that which existed under Nazism and Stalinism. 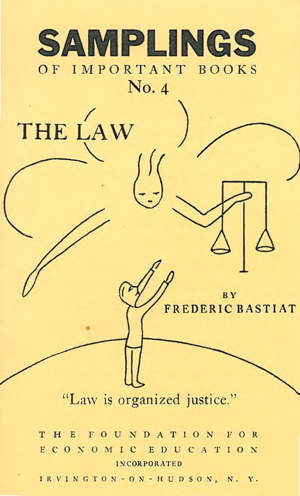 One of Frédéric Bastiat's most powerful essays is La Loi [The Law] which was published as a stand alone booklet in 1850. 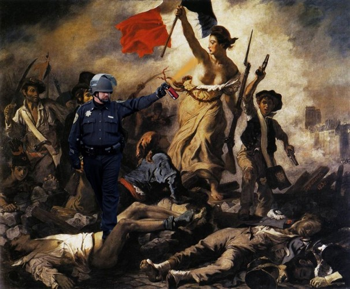 It was written, as was l'État [The State] (1848), as part of his reaction to the rise of socialism during the 1848 Revolution in France. 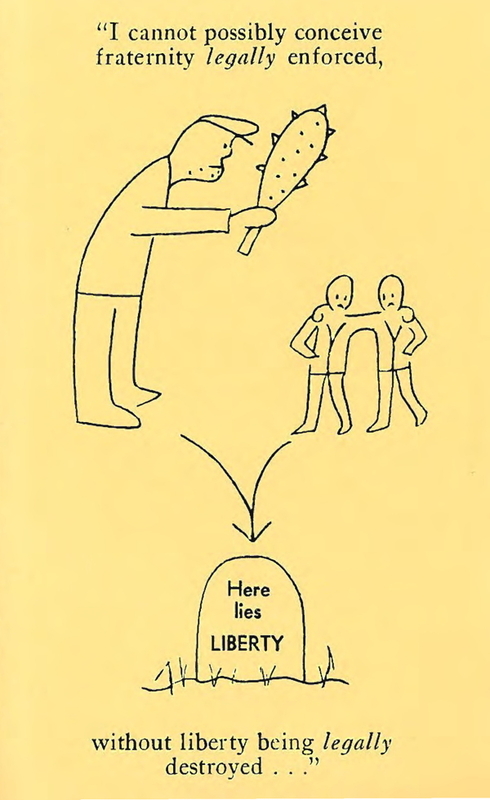 In essence what Bastiat argues in these pamphlets is that forcible redistribution of tax payers money for social purposes (government unemployment relief and the right to a job in particular) is both a violation of the natural right one has to one's life and property (and thus immoral) and also impossible to achieve economically in the long term. 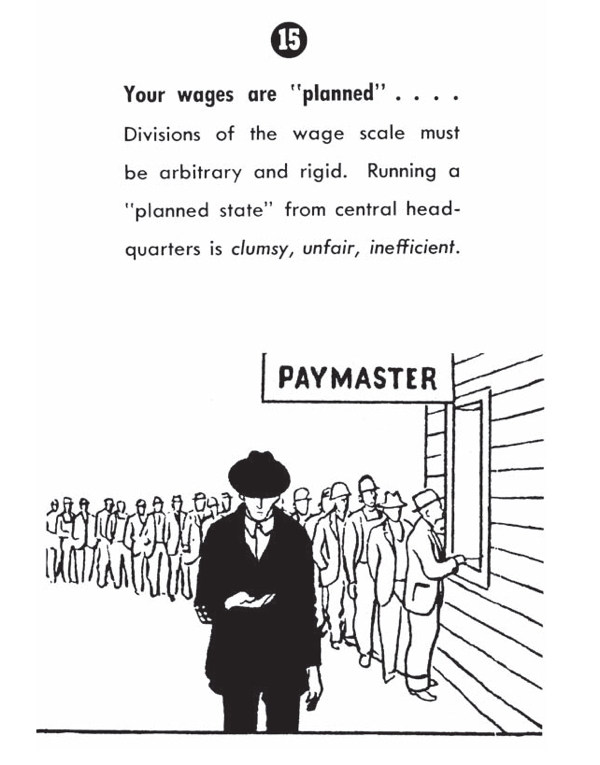 State sanctioned plunder can work very well when a minority plunders the majority, but it is "a fiction" to believe, as many did in 1848 and 1849, that the majority can plunder the majority, which is what happens under socialism. The French editor of the Complete Works of Bastiat, Prosper Paillottet, tells us that The Law was one of the last things written by Bastiat before he died on Christmas Eve 1850, so it is somewhat of a last will and testament. Bastiat wrote it while visiting his friends and family in his hometown of Mugron in June 1850 at a time when he must have know he was soon to die from his debilitating throat condition (perhaps cancer of the throat). Bastiat's writings were popular for a period in Europe, being quickly translated into many European languages and they and the French editions of his works remained in print throughout the 19th century. English translations were also quickly made and Bastiat even a a "school" of followers in the late 19th century in America. Unfortunately his ideas were forgotten until the Foundation for Economic Freedom began to rehabilitate his work with new English translations in the late 1940s. 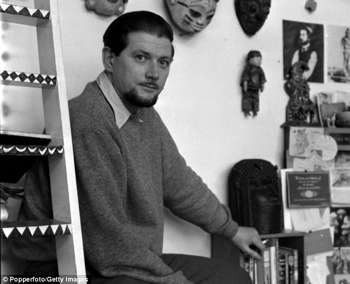 The biography they had written and the new translations of the Economic Sophisms and Economic Harmonies which appeared in the mid-1960s were crucial to the revival of interest in North America in the post-war period. 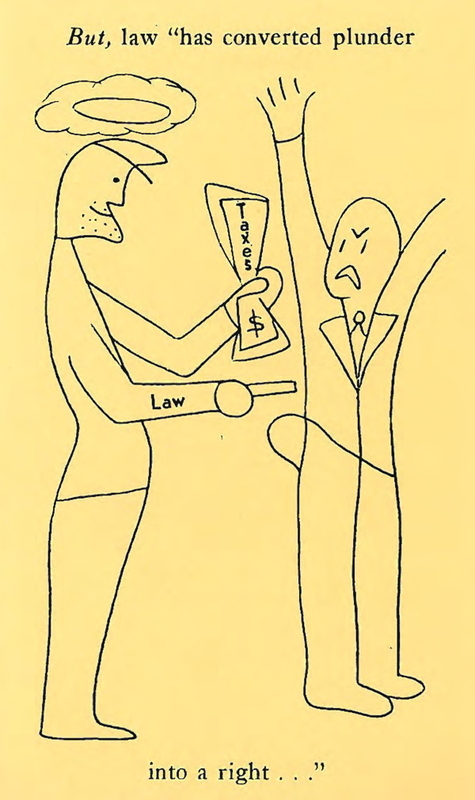 FEE has recently posted on their website this charming abbreviated and illustrated version of The Law [Bastiat for Dummies?] 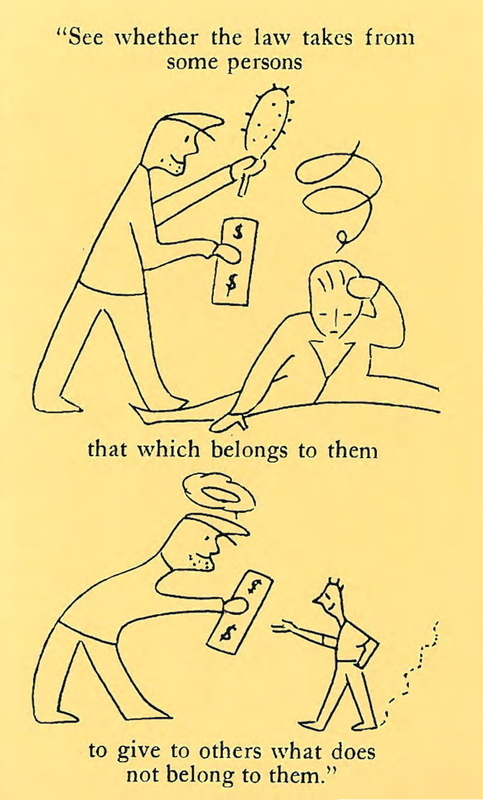 which they published in the late 1940s. It can be found here at FEE and here at my website. 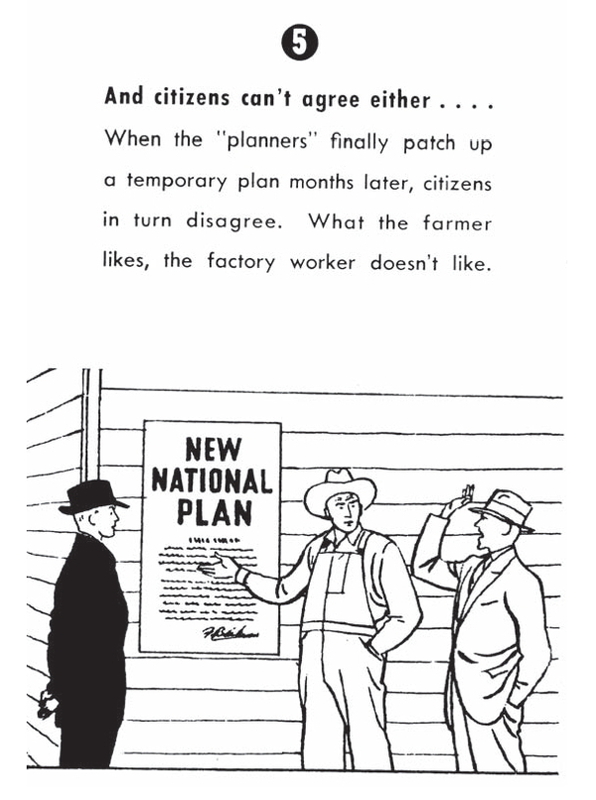 FEE's edition reminds me very much of a similar abbreviated and illustrated version of Friedrich Hayek's The Road to Serfdpm (1944) which appeared at much the same time and which was obviously intended for a similar audience, namely ordinary people who had lived through the enormous expansion of government power which had taken place during the Second World War and who were new to the radical economic and political ideas of liberty which were common place in the 19th century. 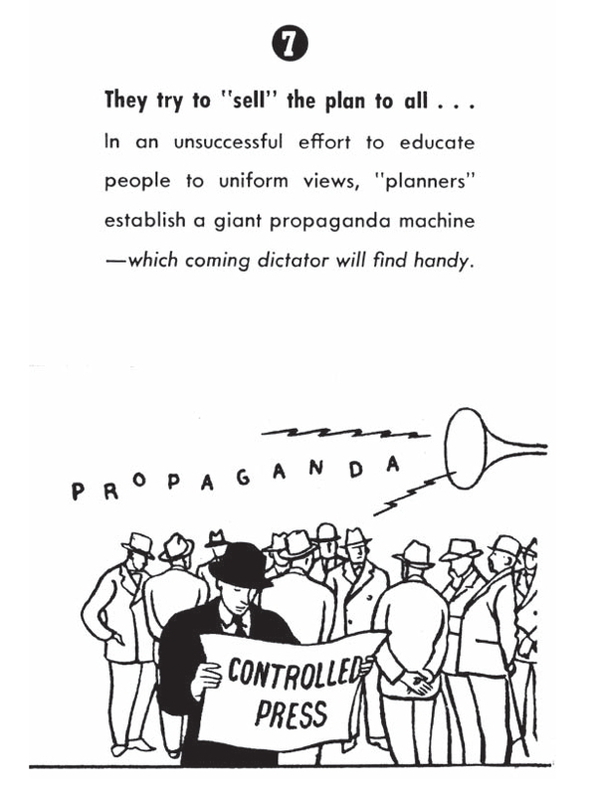 A condensed version of Hayek's Road to Serfdom appeared in the Reader's Digest in April 1945 and an illustrated version in Look magazine in February 1945. See the works by Bastiat on the OLL <http://oll.libertyfund.org/person/25> including a version of The Law published by FEE <http://oll.libertyfund.org/title/78> [warning: the FEE translation has very annoying and unnecessary headings inserted by the translator which were not in the original]. 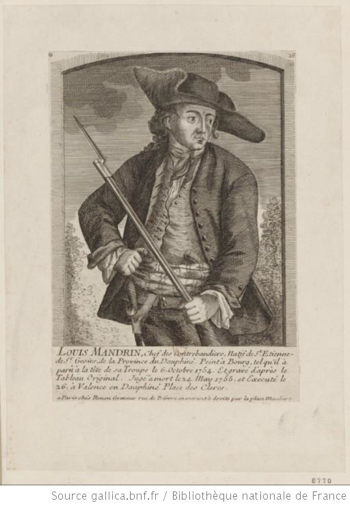 Louis Mandrin (1725-55) was a famous 18th century brigand and highwayman who challenged the privileges of the Farm General (la Ferme générale - or "Tax Farmers") by smuggling goods across the French border which were the monopoly of the Farm General. 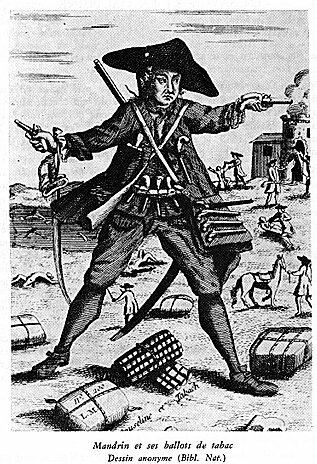 The Farm General was reorganized in 1726 to include a group of 40 (later 90) politically well connected individuals (the Farmers General - "les Fermiers généraux) who were given exclusive contracts by the king (via the Minister of Finance who received his cut in the form of bribes, or "pots-de-vin") to sell and thereby collect taxes on such items as salt, tobacco products, wine, and to enforce compulsory work on public goods such as roads (the octrois). This was an early version of "contracting out" or "privatizing" the collection of customs and taxes and was much hated by ordinary people in the 18th century. 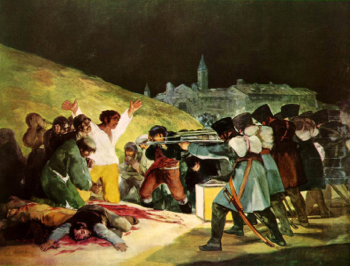 When the Farmers General were abolished in 1971 28 of the members were arrested and executed, including the mathematician Antoine Lavoisier. 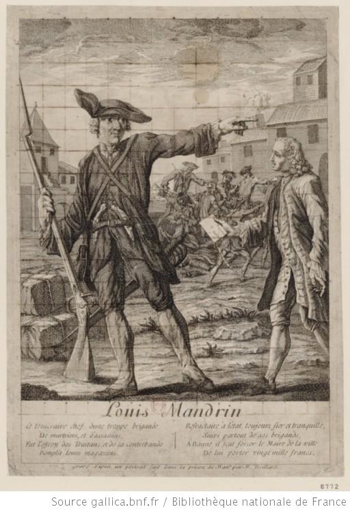 Mandrin was under contract with the Farm General to supply mules to the French army but when most of the died in transit the Farm General refused to pay him. 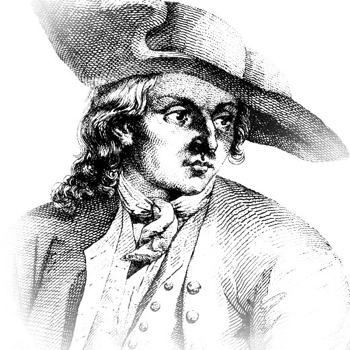 After several run ins with the law resulting in Mandrin being condemned to death in 1753 and after his younger brother was executed for counterfeiting, Mandrin "declared war" on the Farmers General and began smuggling untaxed goods across the Swiss border and selling them in France. 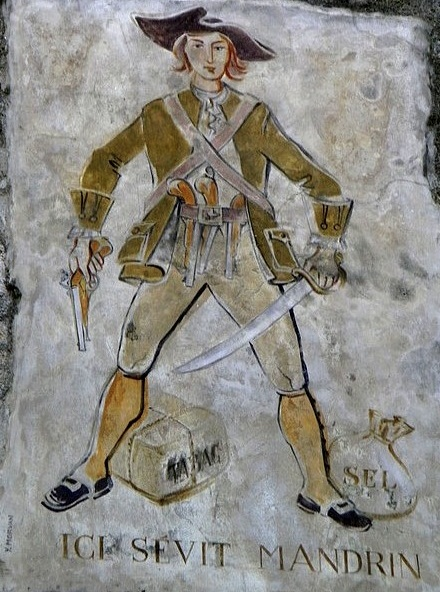 He became a popular hero for resisting the tax collecting Farmers General, which he did for the following 2 years before he was finally arrested and executed. 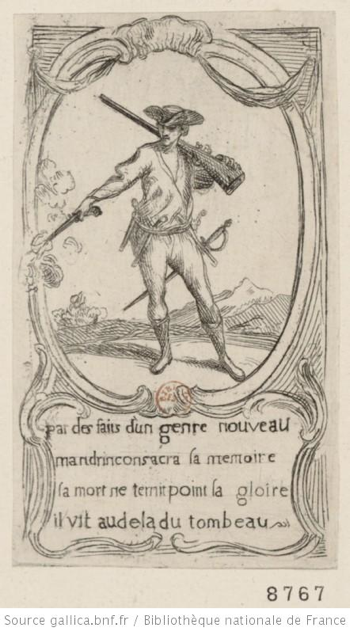 Mandrin became a folk hero about whom popular songs were written and in the 20th century even films and a TV show were made about his exploits. A local Grenoble dark beer was also named after him in 2002. 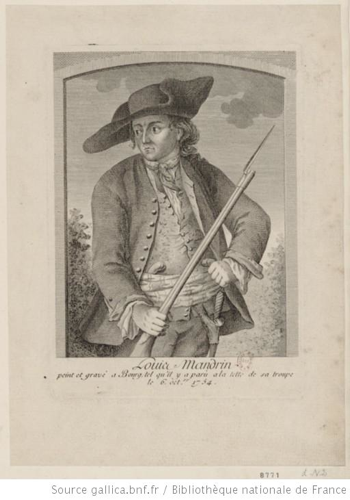 Begin with the Wikipedia article (in English) <http://en.wikipedia.org/wiki/Louis_Mandrin> and then the French one <http://fr.wikipedia.org/wiki/Louis_Mandrin>. 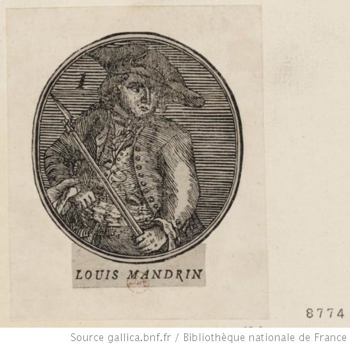 There is a Mandrin website (in French) with lots of resources <http://www.mandrin.org/>. 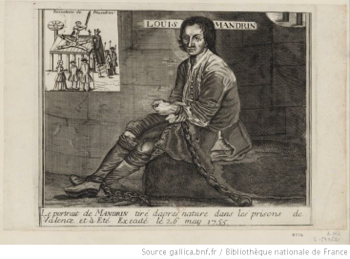 A film of the exploits of his followers after his execution will be appearing in early 2012 - Les Chants de Mandrin (2011), "The Ballads of Mandrin". 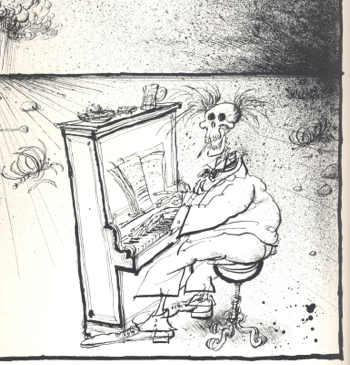 The webiste with a trailer is here <http://www.mandrin.org/les-chants-de-mandrin.html>. 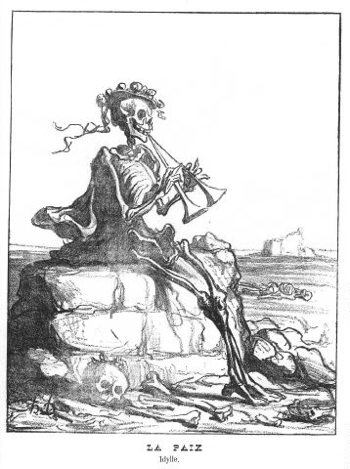 This is my favorite depiction of Mandrin. He is telling the Tax Farmer (who is showing him his official papers from the King) where to go. The goods he is "liberating" from the tax farmer so he call sell them tax free to the people are scattered on the ground. This is the saddest one with Mandrin chained in prison waiting to be beaten of the rack and slowly killed by the French Army. Molinari saw a French translation of a British pamphlet of an article which was first published in the Westminster Review in January 1830. 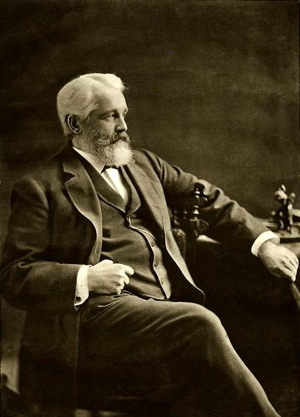 "The Article on Free Trade”was written by Col. Thomas Perronet Thompson who was very active in the free trade movement and whose work on the Corn Law Fallacies influenced Frédéric Bastiat. 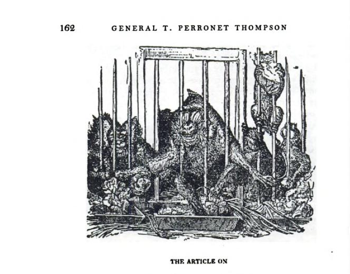 The essay was accompanied by a cartoon drawn by Thomas Landseer (1795-1880) who had made a name for himself by publishing a series of caricatures of humans as monkeys, Monkey-ana, or Men in Miniature (1827). 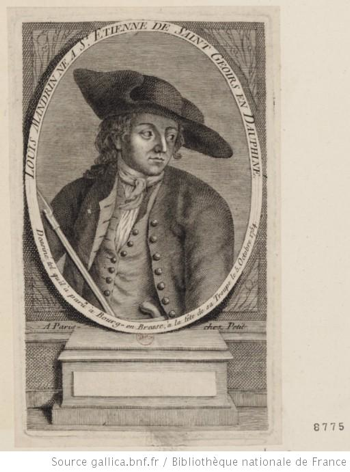 Molinari was so taken with Landseer's drawing that he mentioned it twice: once in Les Soirées and again in his article on "Liberté du commerce”in the DEP. 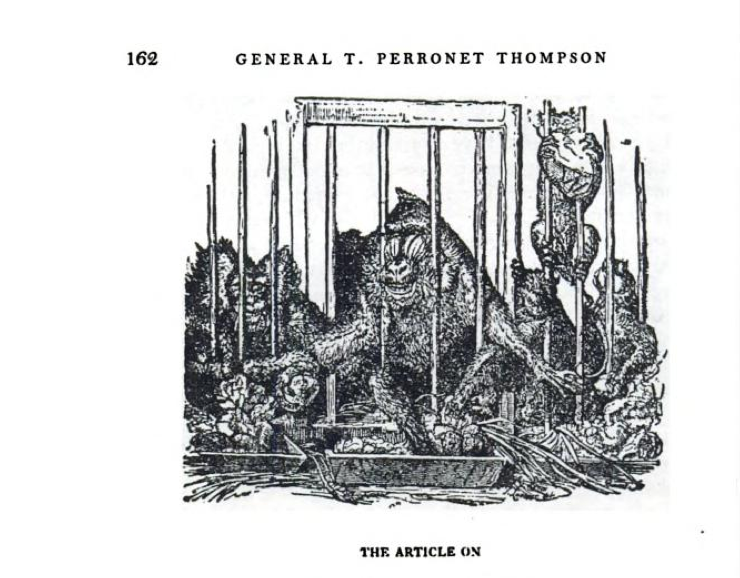 Thompson began his article with this description of the cartoon: "The monkeys in Exeter Change used to be confined in a row of narrow cages, each of which had a pan in the centre of its front for the tenant's food. When all the monkeys were supplied with their messes, it was observable that scarcely any one of them ate of his own pan. 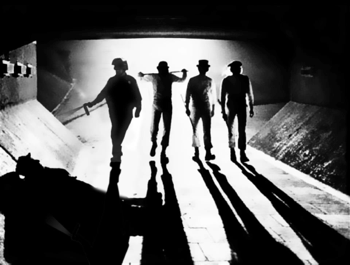 Each thrust his arm through the bars, and robbed his right or left hand neighbor. Half what was so seized was split and lost in the conveyance; and while one monkey was so unprofitably engaged in plundering, his own pan was exposed to similar depredation. The mingled knavery and absurdity was shockingly human.”This "beggar thy neighbor”policy is very similar to the views expressed by Huskisson in 1826 also quoted by Molinari. See, The Article on Free Trade, from the Westminister Review, no. XXIII. For January, 1830. To which is added a Collection of Objections and the Answers (London: Robert Heward, 1831); French translation of T. Perronet Thompson, Les Singes économistes, ou qu'est-ce que la liberté du commerce? 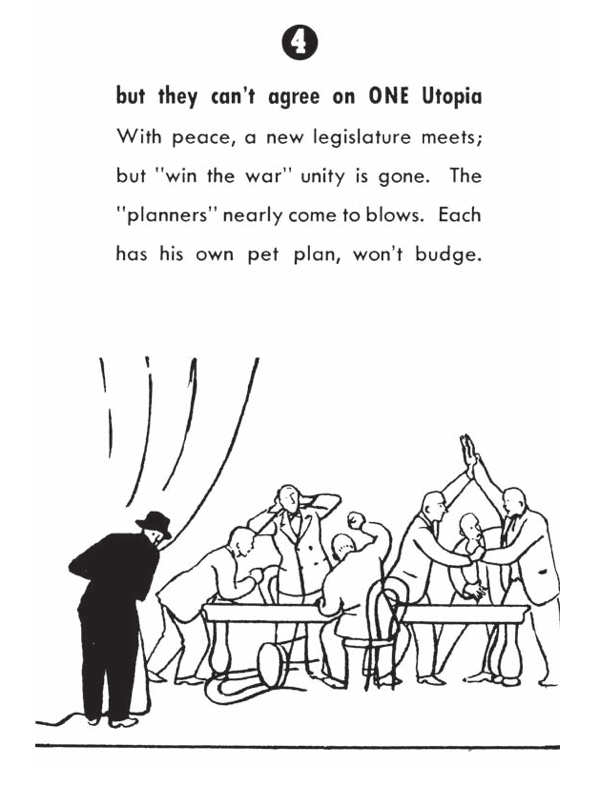 extrait de la "Revue de Westminster" (The Monkey Economists, or what is free trade? ), traduit de l'anglais par Benjamin Laroche (Paris: Goetschy fils, 1832). 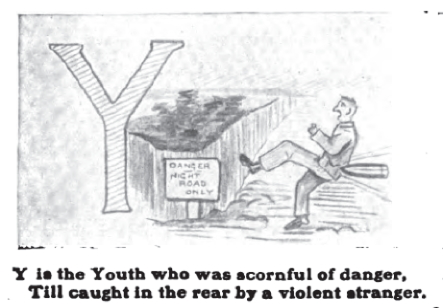 A version of this cartoon also appeared in America in 1831 by E.W. 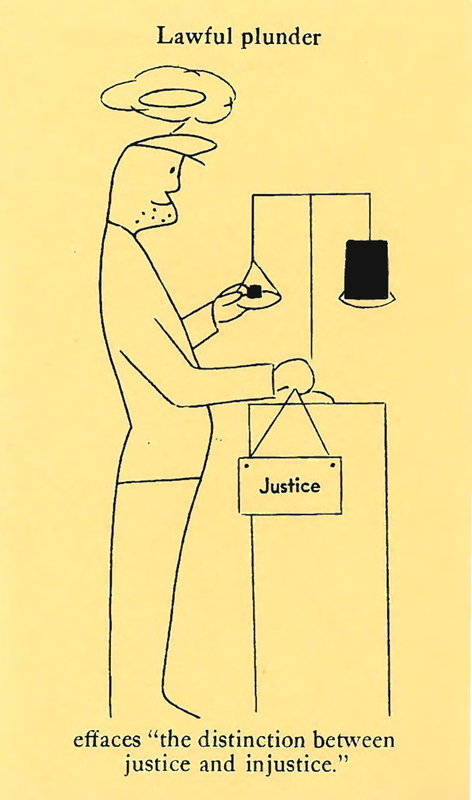 Clay entitled "The Monkey System or 'Every one for himself at the expense of his neighbor'!!!!!!!!". Above the monkeys' cages is written "Home, Consumption, Internal Improvements,”and a figure states "Walk in! Walk in! and see the new improved grand original American system.” The American System as it was called was based upon high tariffs and extensive government funded infrastructure projects. 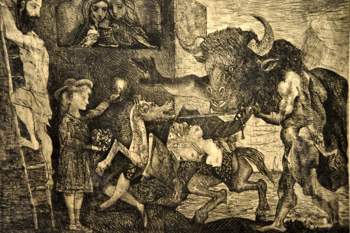 In early December I was able to go to the Art Gallery of NSW to see the Picasso exhibit which consisted of 150 odd pictures and sculptures lent by the Picasso Museum in Paris. 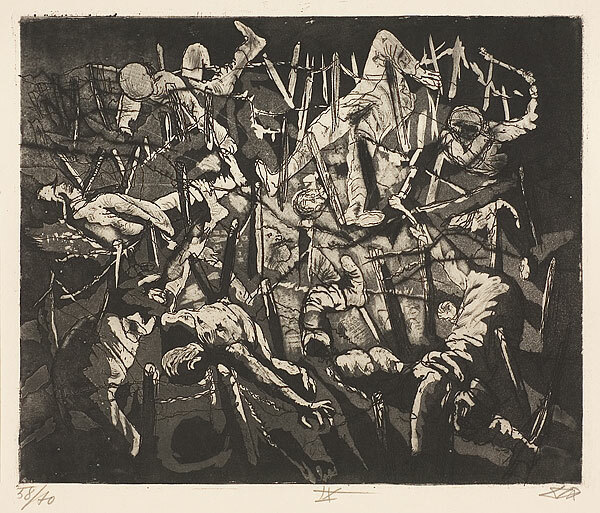 I was excited to see for the first time two pictures which I had never seen in the flesh before - "Minotauromachy" (1935) and "Massacre in Korea" (1951). 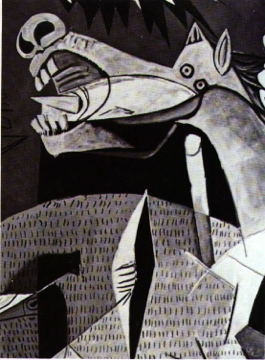 [See my study guide on Picasso's war art for more info]. 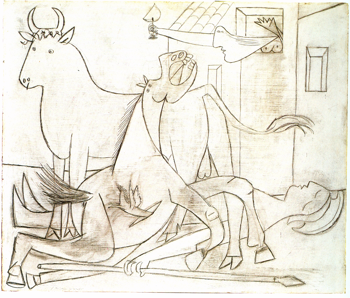 The "Minotauromachy" (1935) has many references to classical mythology and prefigures some of the imagery which we see a couple of years later in "Guernica" (1937): the bull, the injured horse, the girl/woman with the lamp, people in a window surveying the scene, etc. 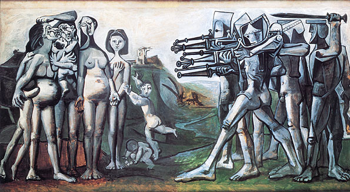 The "Massacre in Korea" (1951) has robotic, futuristic soldiers lined up to shoot innocent women and children. 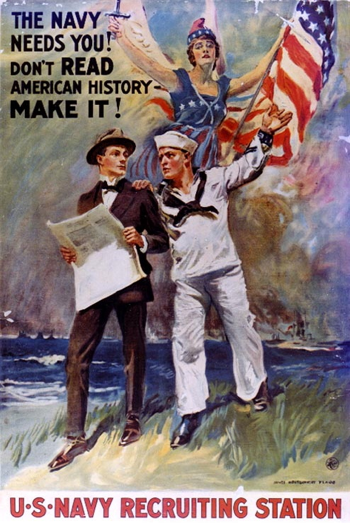 When reading Michael Kammen, In the Past Lane: Historical Perspectives on American Culture (OUP, 1999) I came across this piece of war propaganda by James Montgomery Flagg, "The Navy Needs You" (1917). 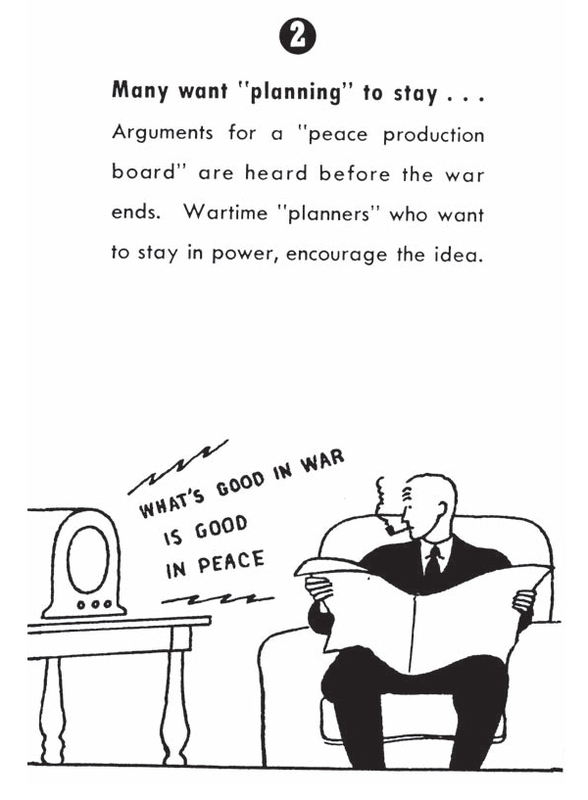 The unintended irony of the image is that if one did read history one might be less inclined to "make history" by going off to fight in an unnecessary or unjust war. 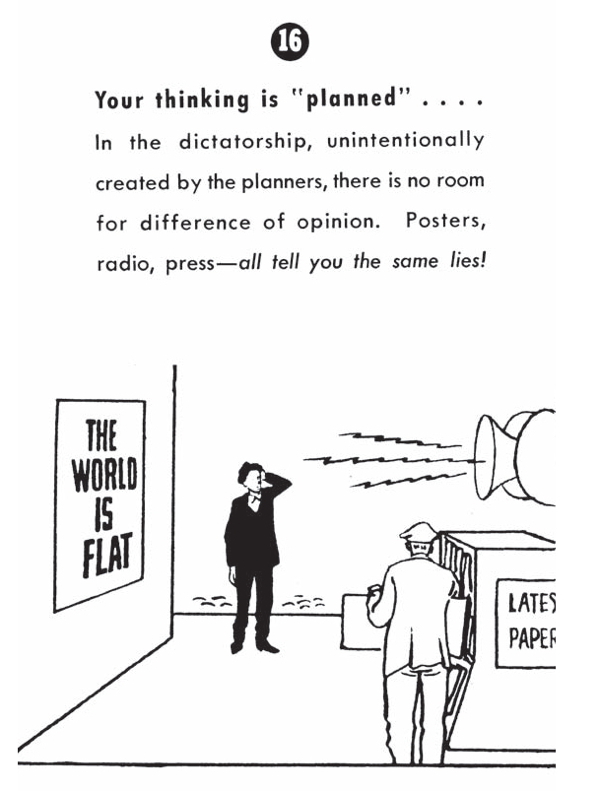 The gloriously named "James Montgomery Flagg" did several dozen propaganda posters for the US government during WW1. 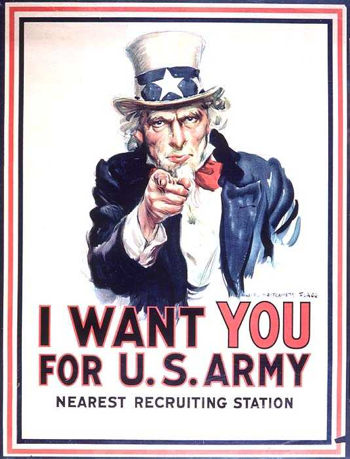 Flagg is best known for his "Uncle Sam Needs You" recruiting poster. 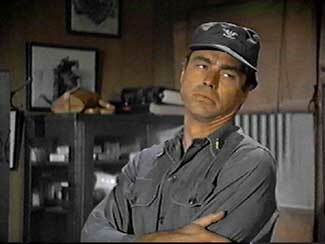 If you were a novelist and you gave the name "Flagg" to a super patriot people would laugh at you. This was also the name given to the super patriotic CIA officer in the TV series M*A*S*H and viewers quite rightly laughed at his stupidities.